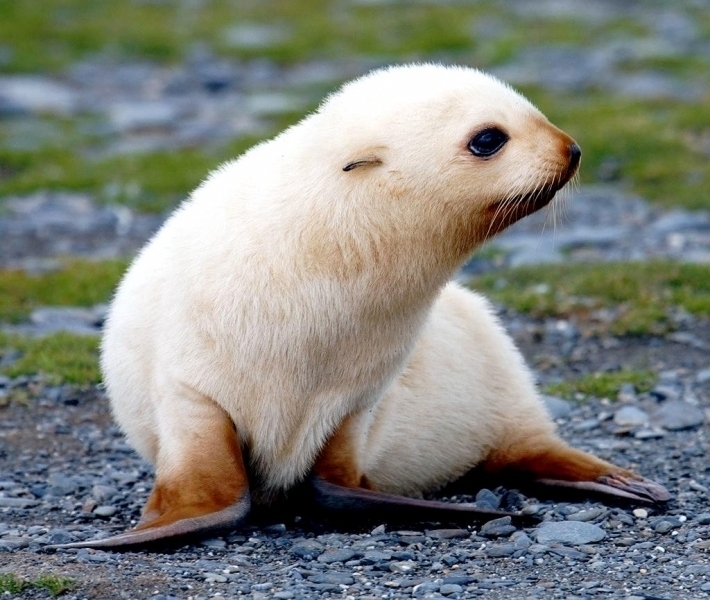 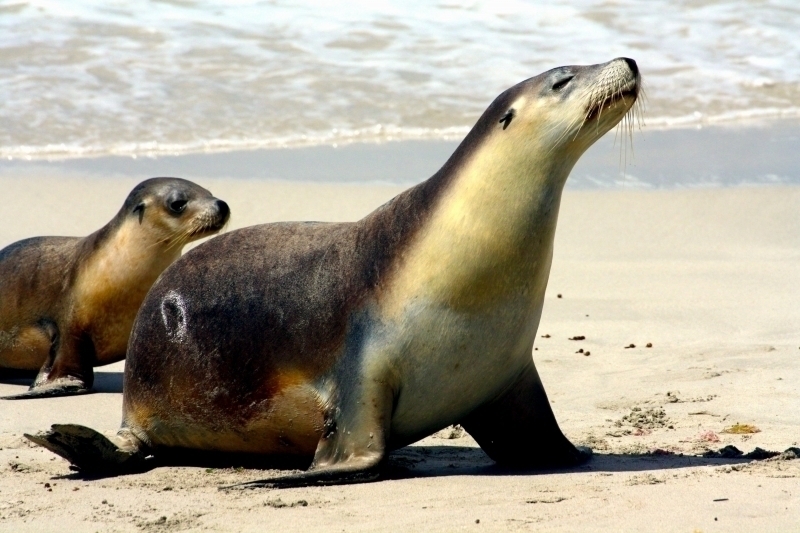 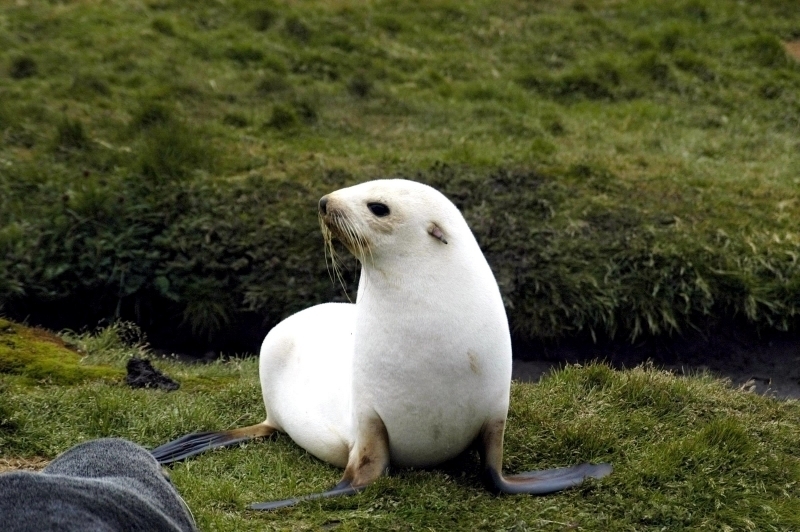 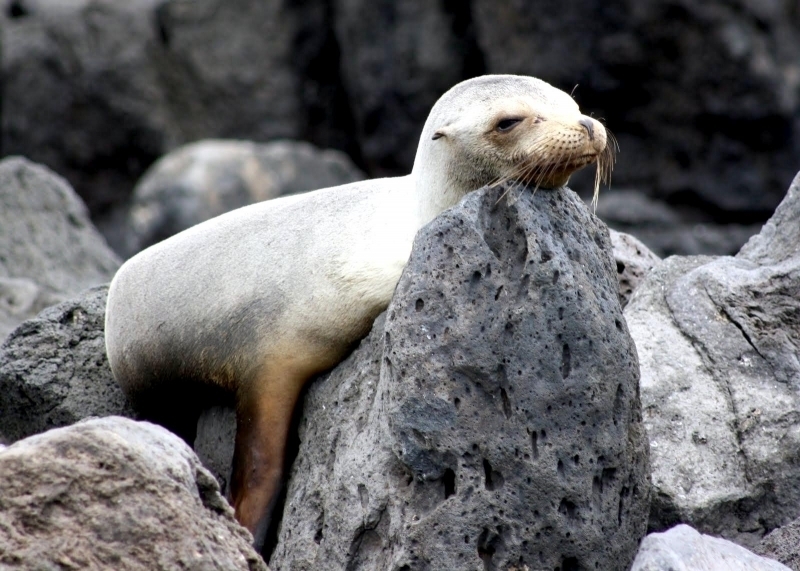 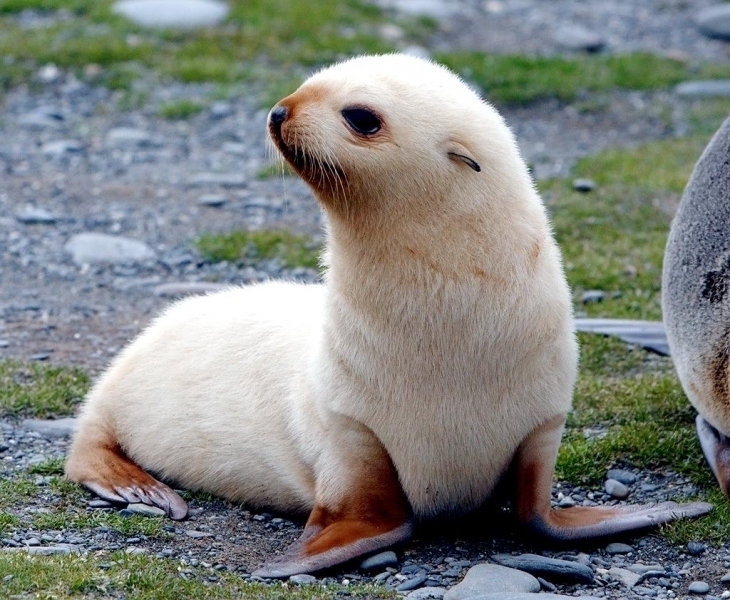 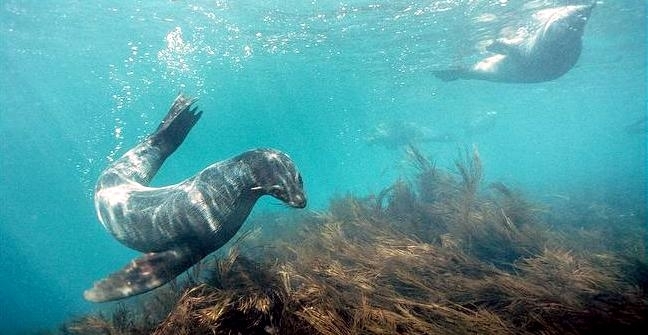 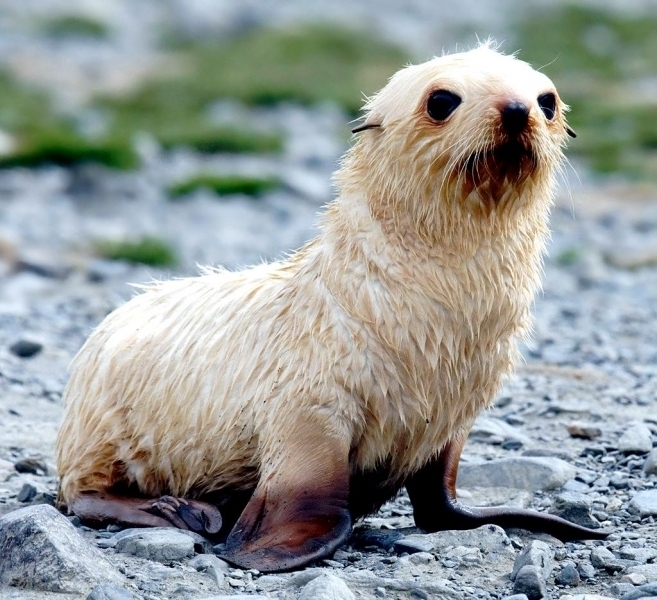 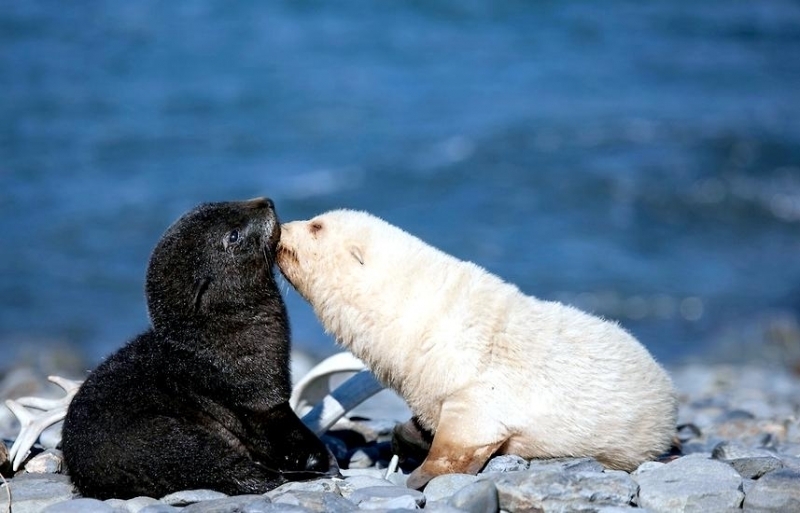 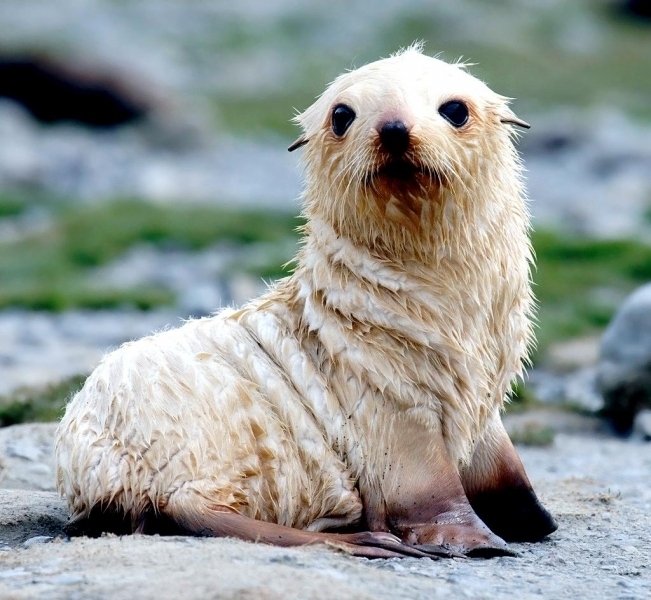 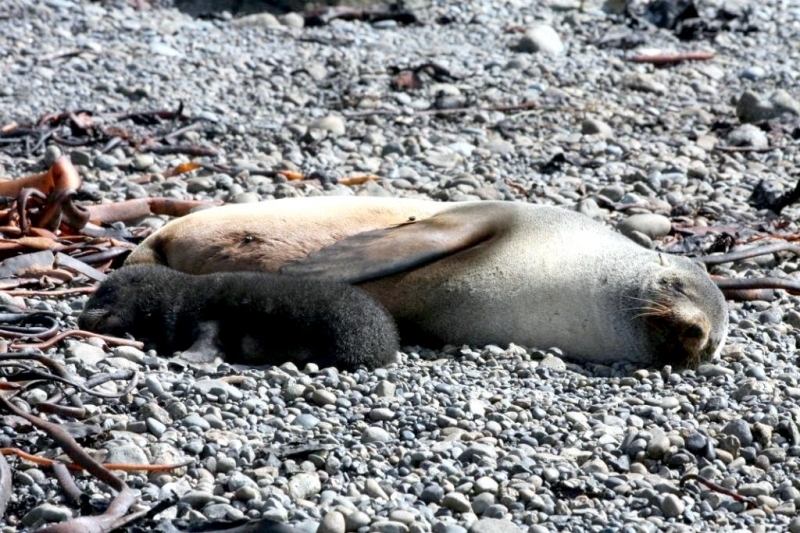 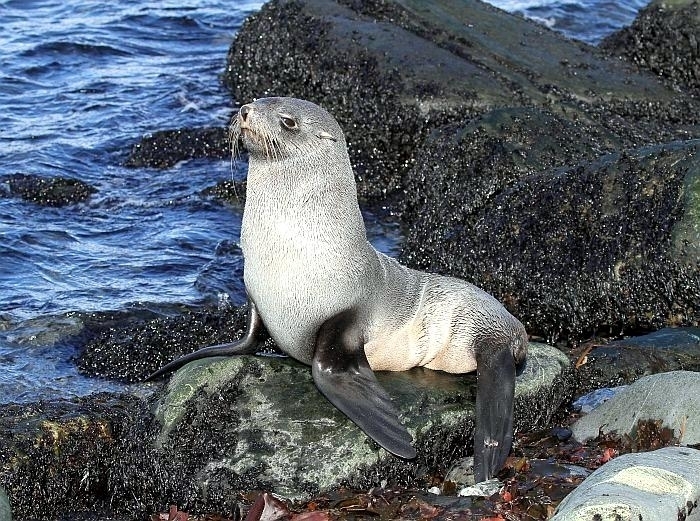 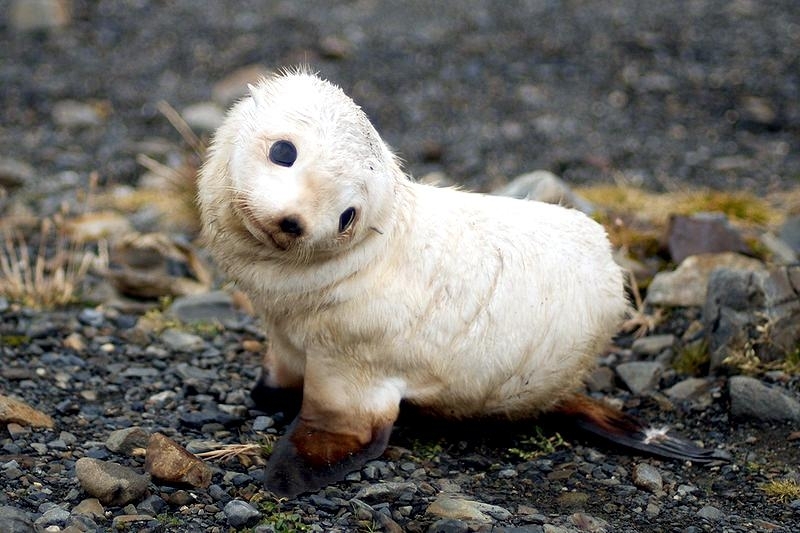 Antarctic Fur Seals are also known as Australian Blonde Seals and are distinguished by the presence of external ears and their ability to use their flippers to prop themselves up into a “standing” position. 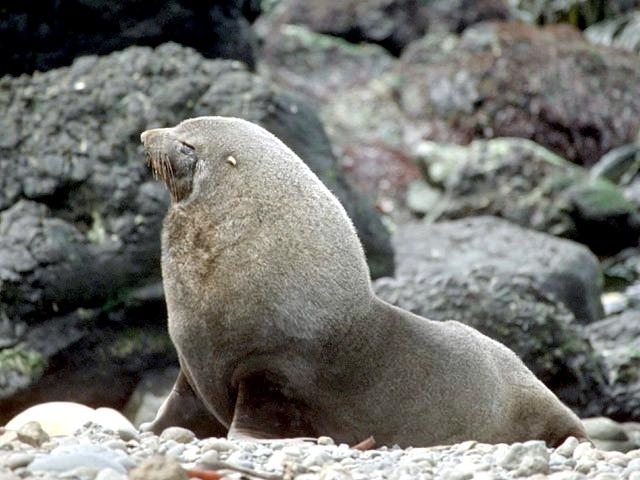 Adult males of measure 1.6-2 meters in length and weigh between 90-210 kilograms, averaging 188 kilograms. 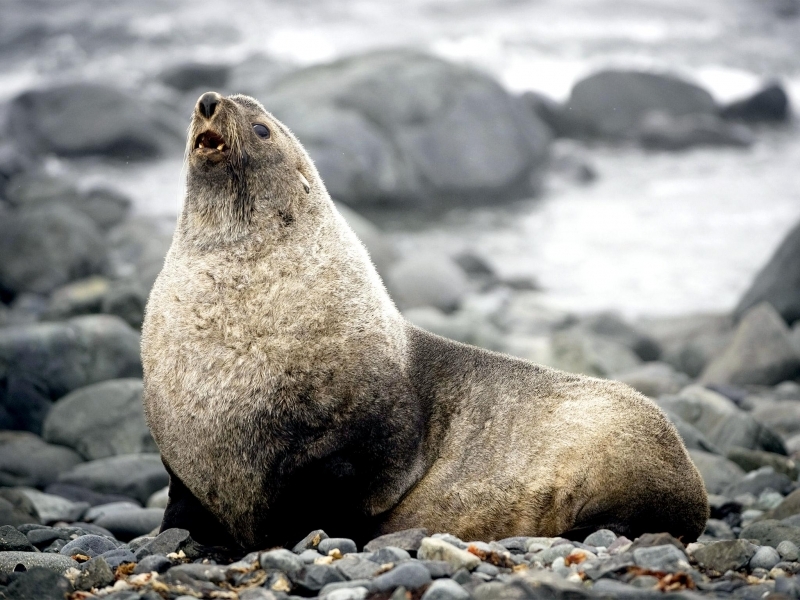 Adult females are significantly smaller measuring 1.2-1.4 meters in length and weighing between 25-55 kilograms, averaging 37 kilograms. 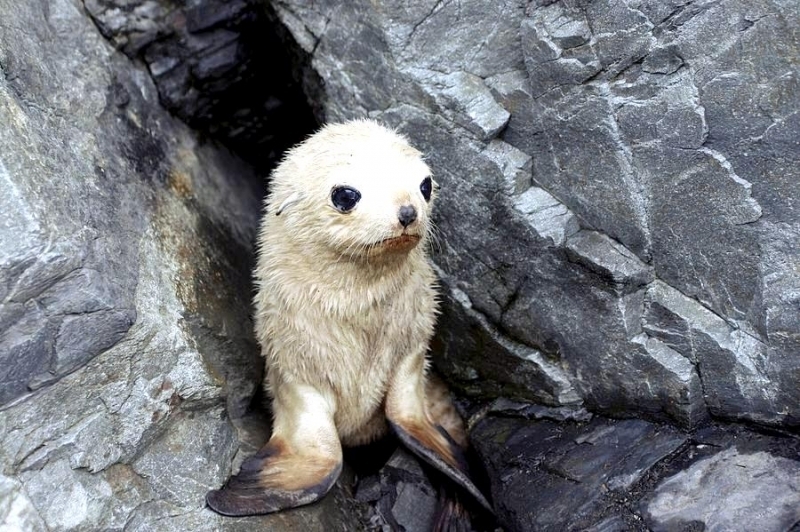 Pups measure between 60-73 centimeters in length at birth and weigh 4.5-6.5 kilograms, with male pups weighing slightly more than the females. 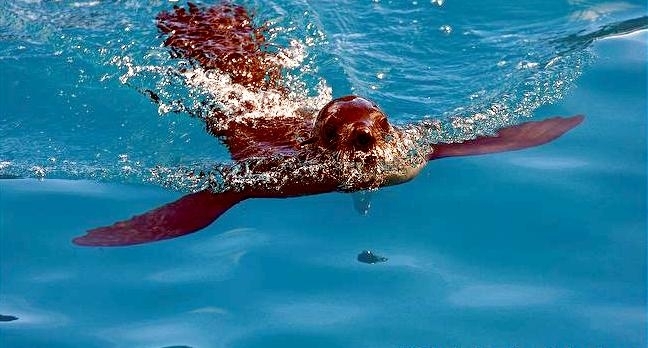 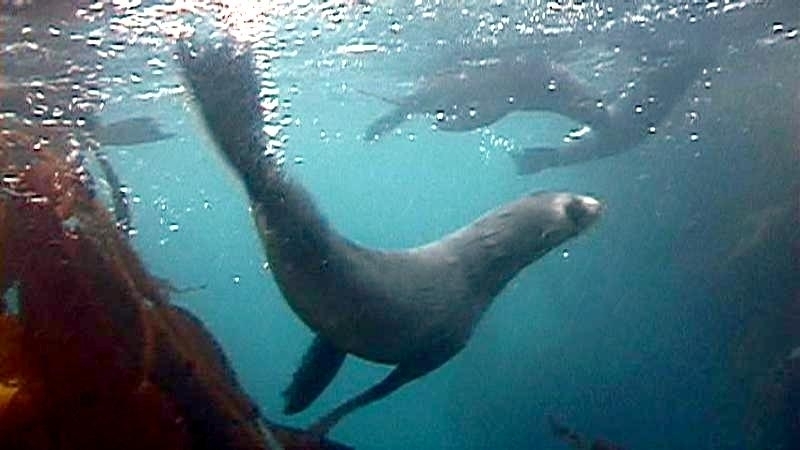 Antarctic Fur Seals can dive for up to 10 minutes as deep as 250 meters, however dives usually average 3-4 minutes at 30-40 meters. 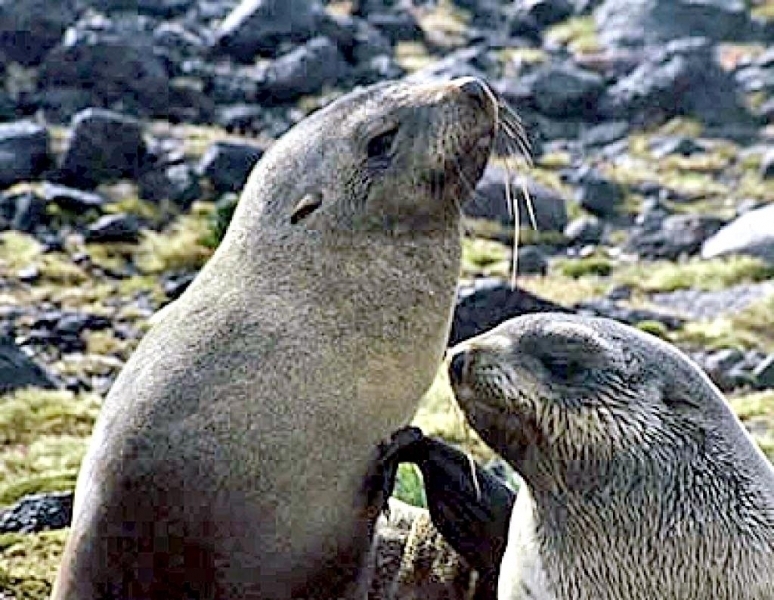 Males can live up to 15 years of age, females up to 23 years. 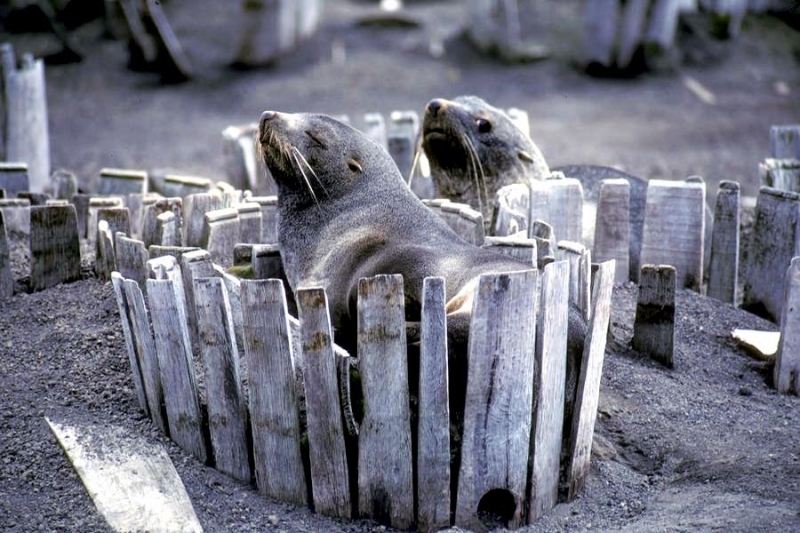 The breeding range for Antarctic Fur Seals is restricted mainly to seasonally ice-free islands near the Antarctic polar front. 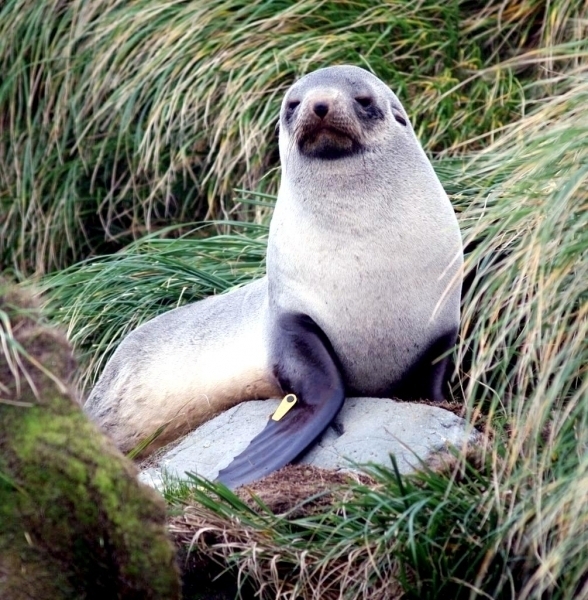 More than 95% of the species breed near the coast of South Georgia. 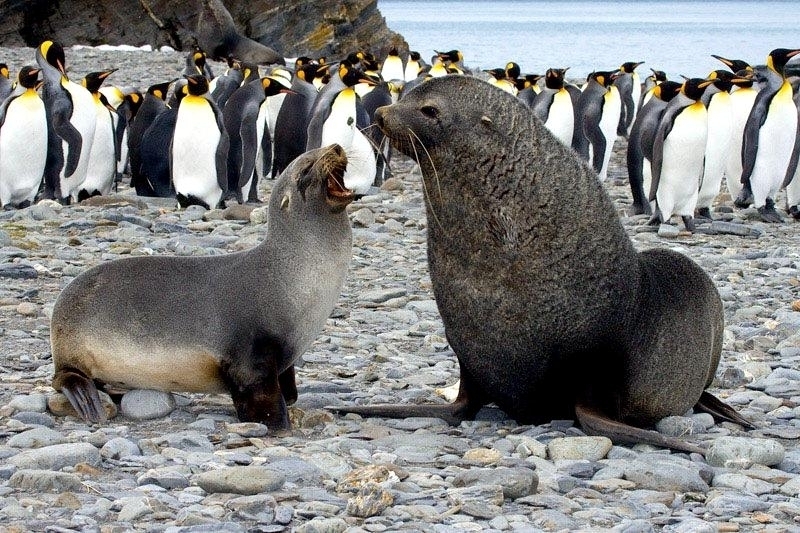 Other breeding sites are found on the Bouvetøya, Crozet, Heard, Kerguelen, Macquarie, Marion, McDonald, Prince Edward, South Orkney, South Sandwich and South Shetland Islands. 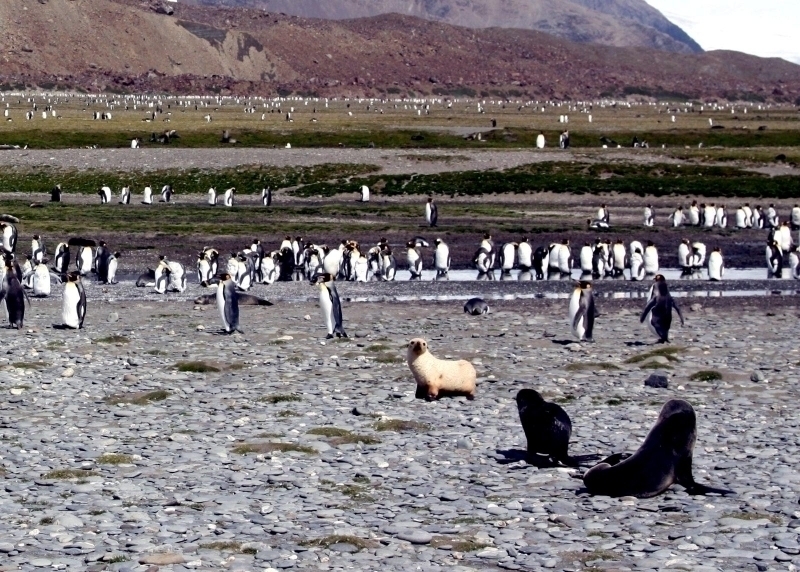 In 1990, the total population size was estimated at 1.5 million however, more recent estimates put the population at over 4 million. 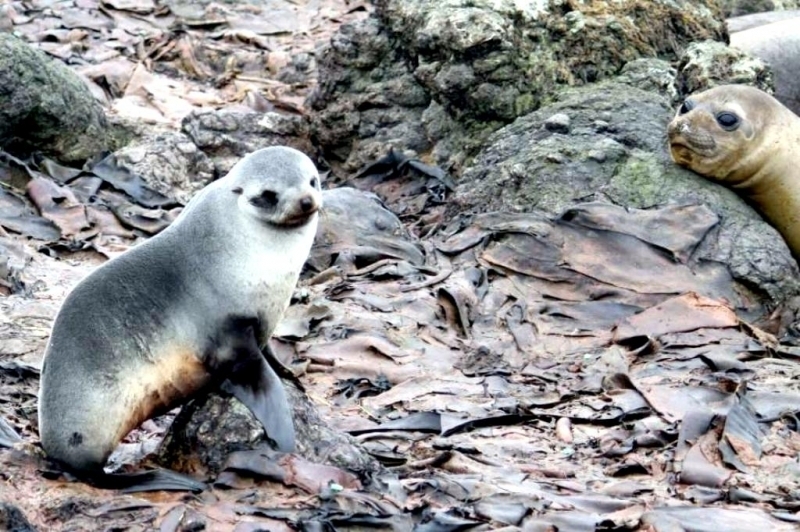 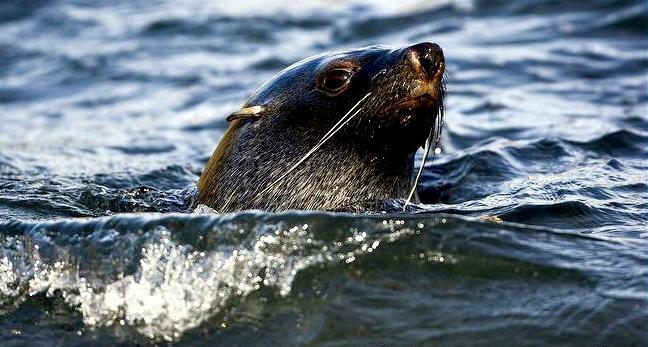 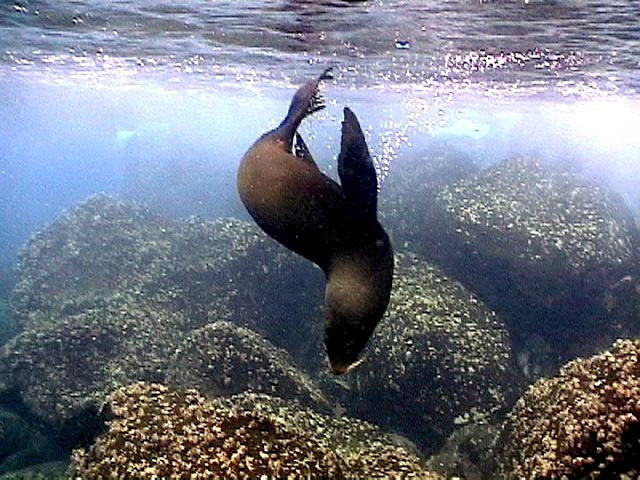 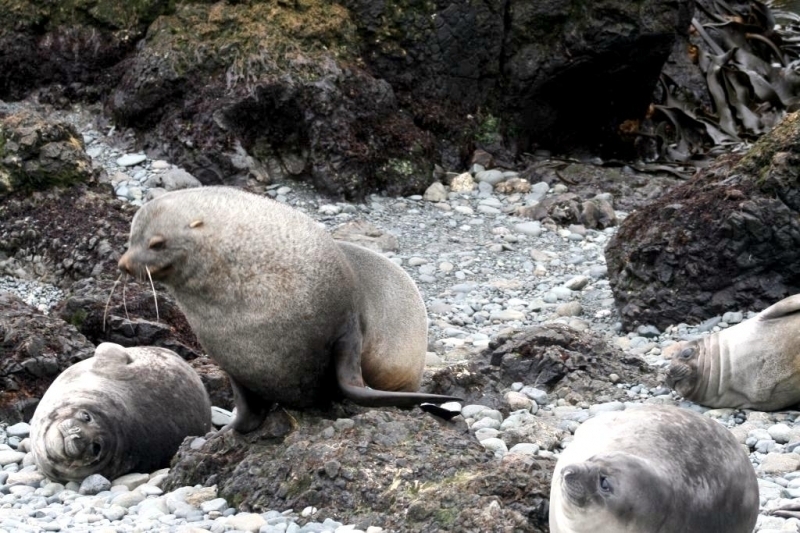 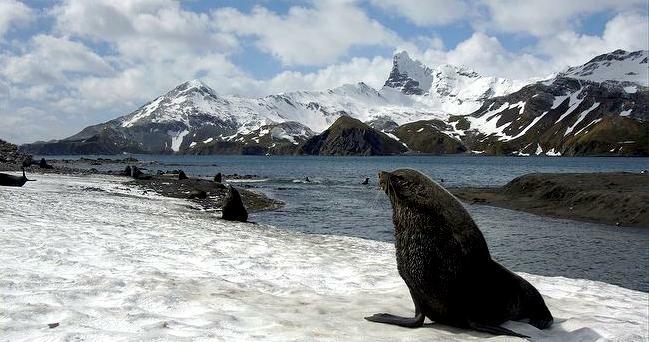 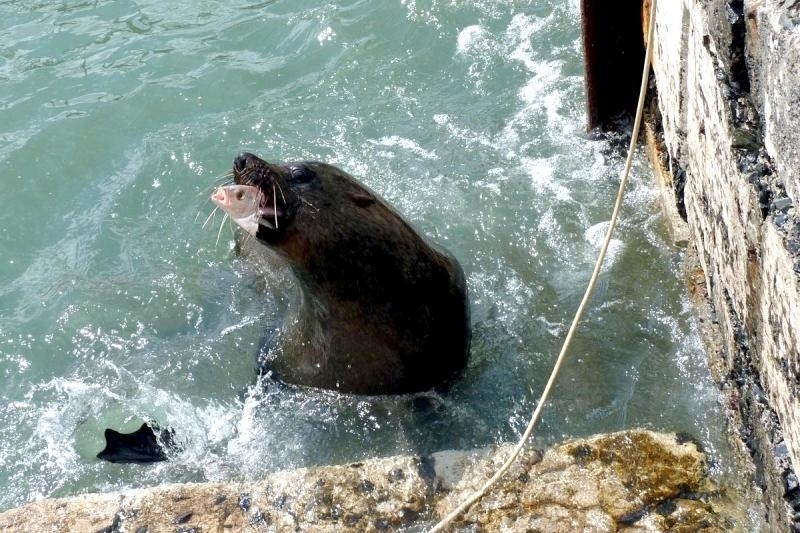 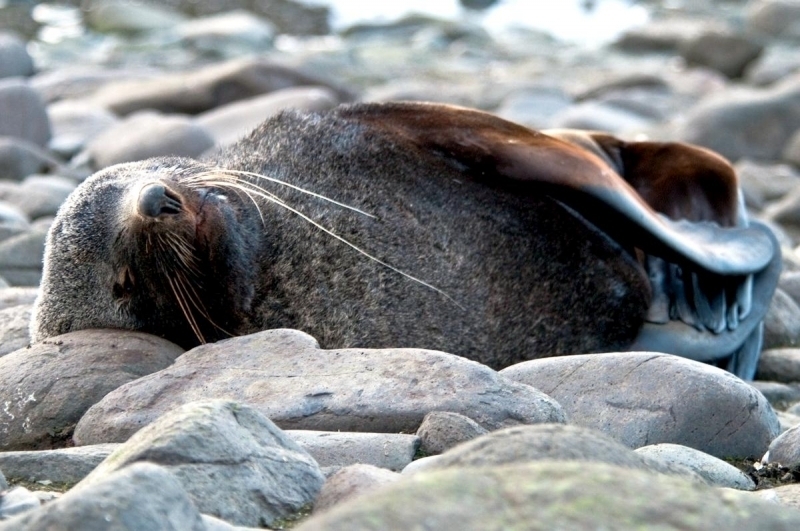 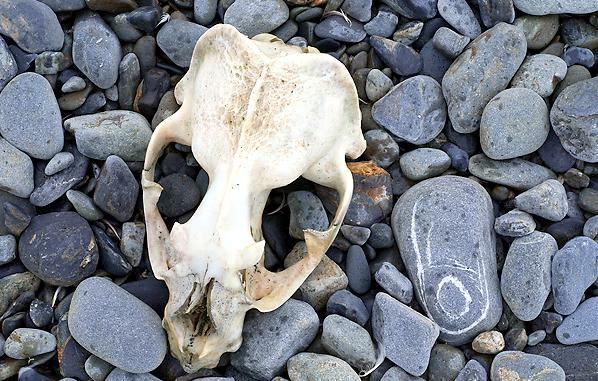 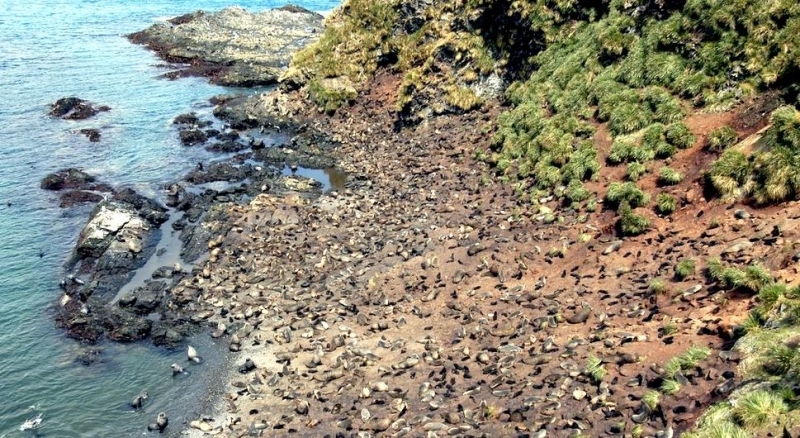 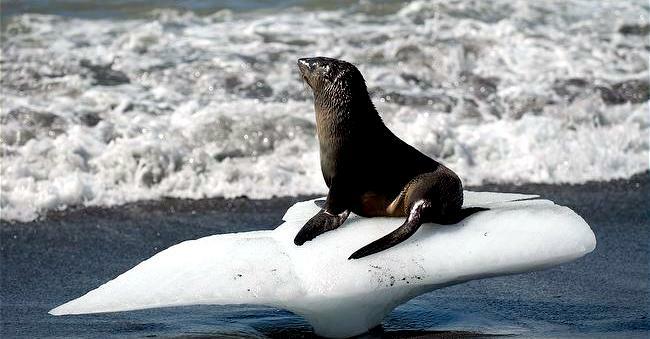 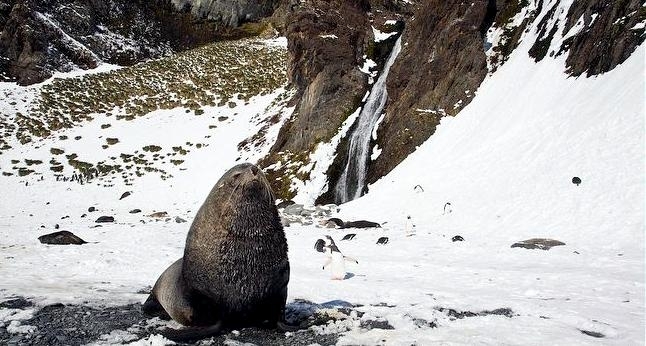 Wandering Antarctic Fur Seals have been found as far north as Brazil. 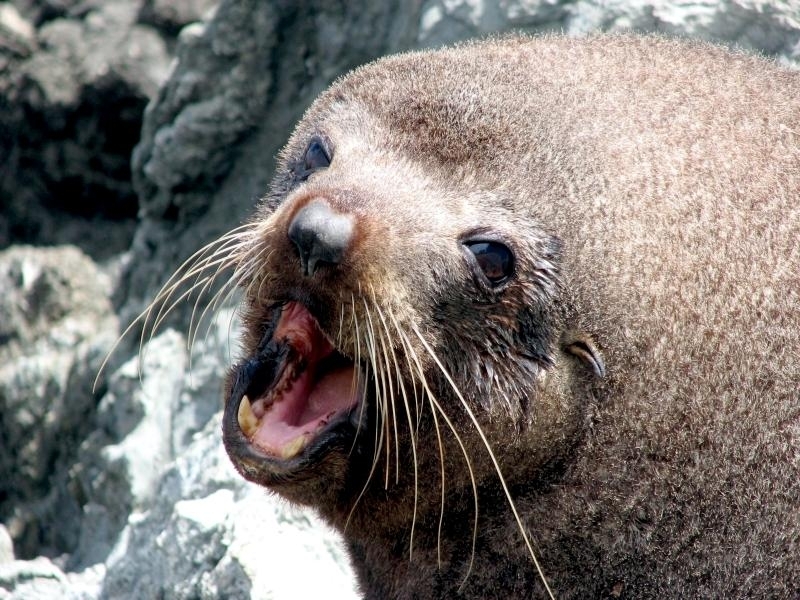 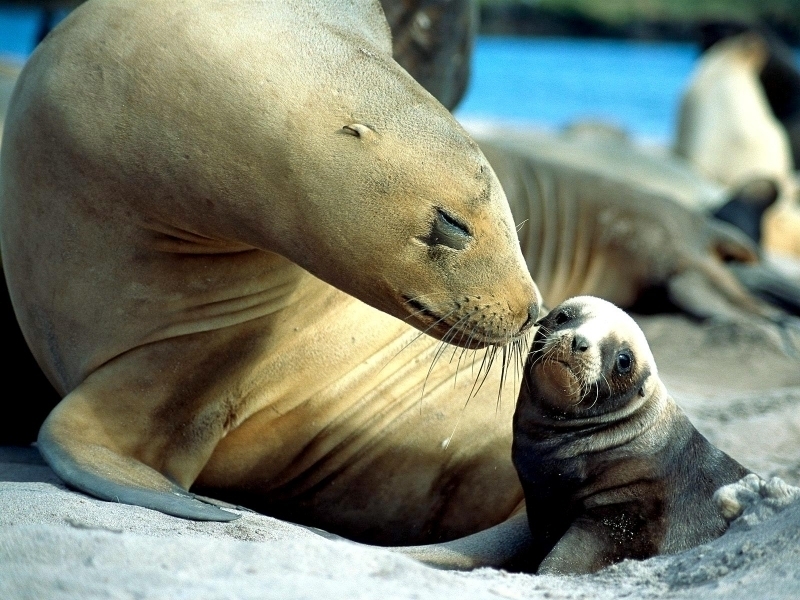 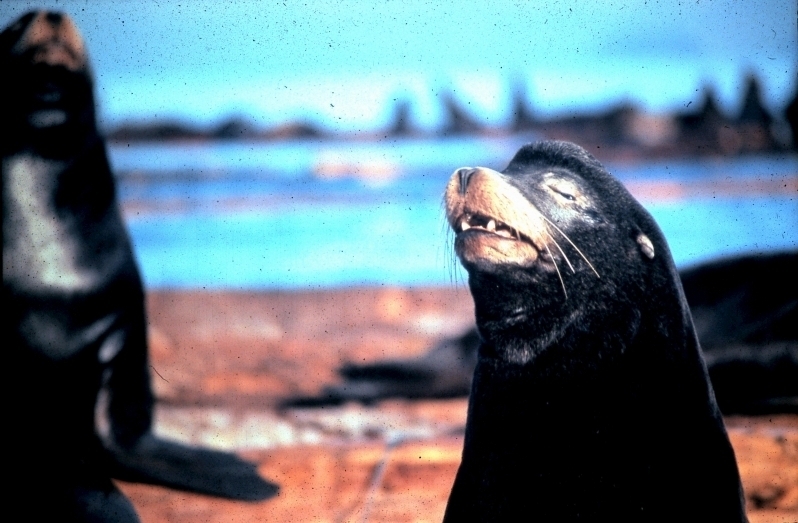 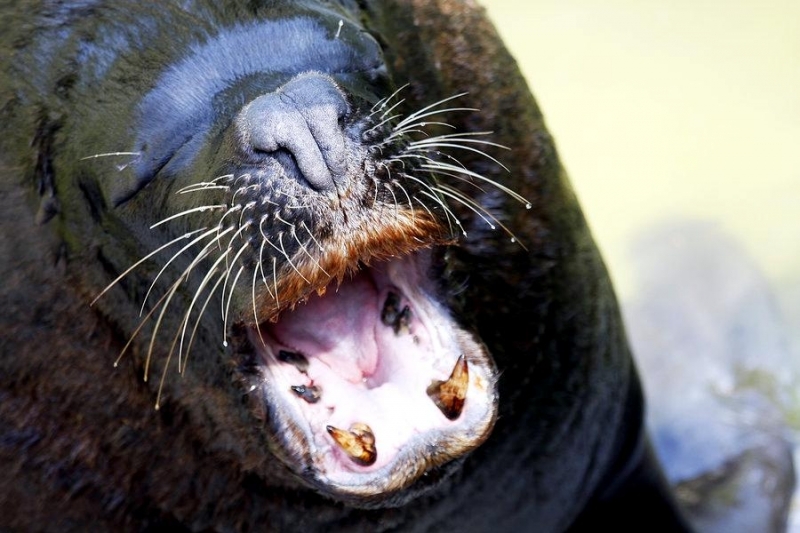 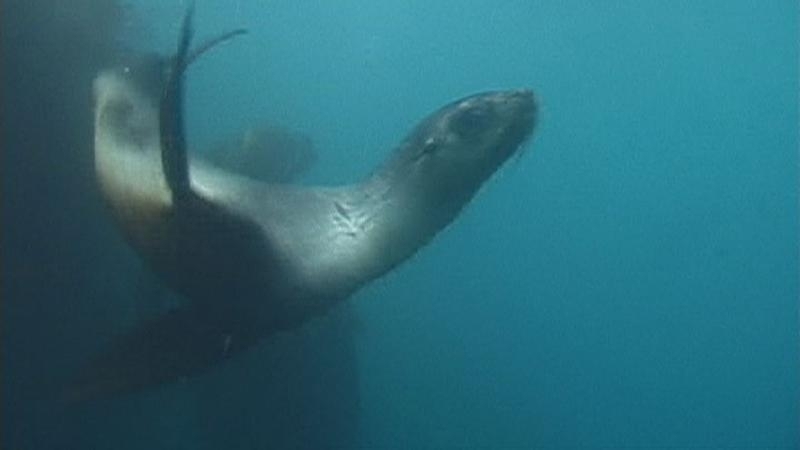 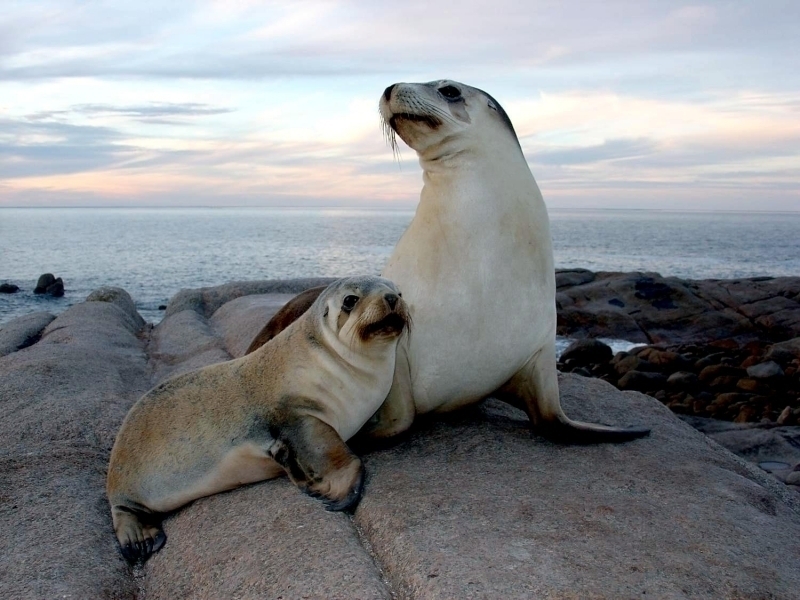 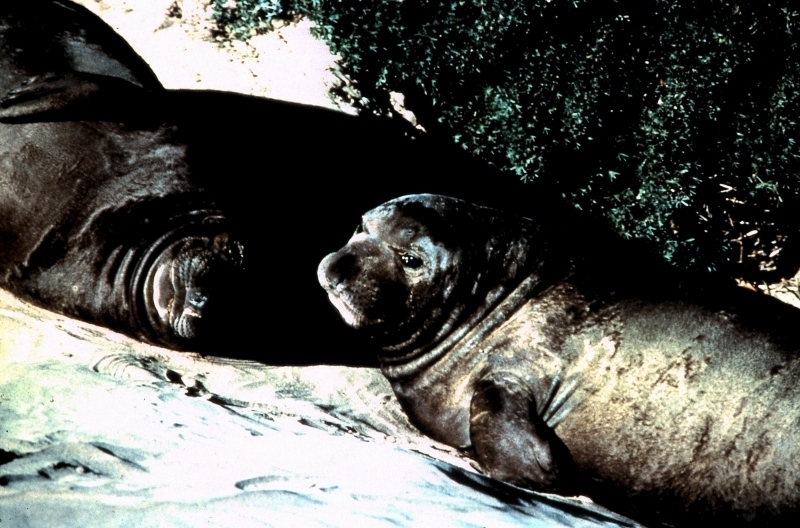 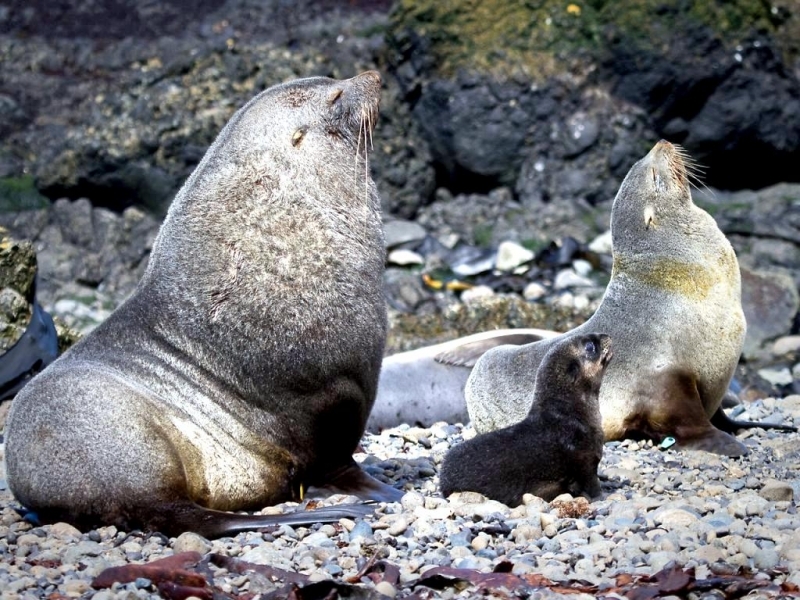 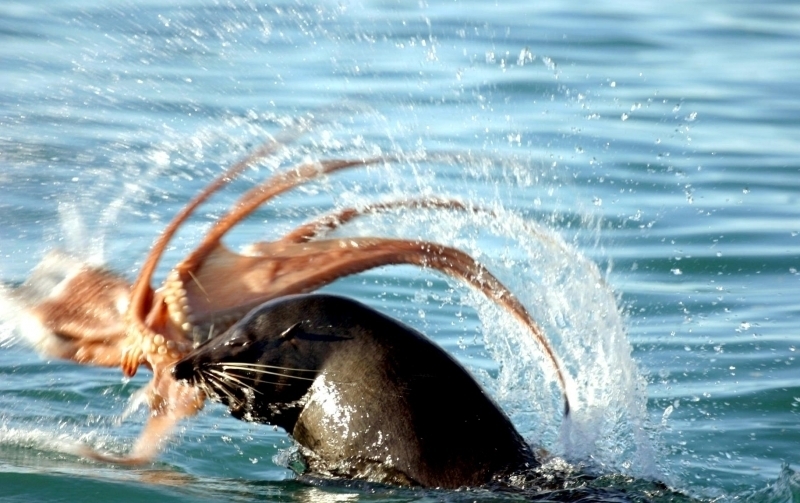 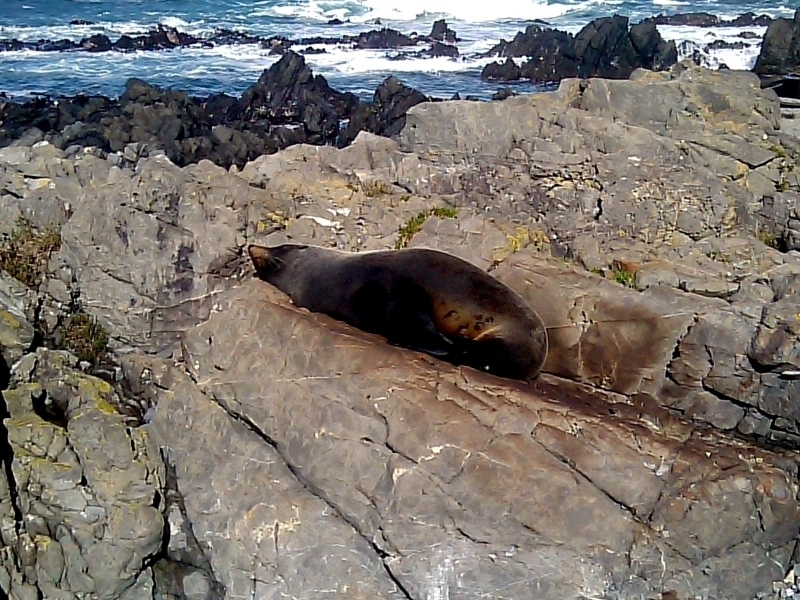 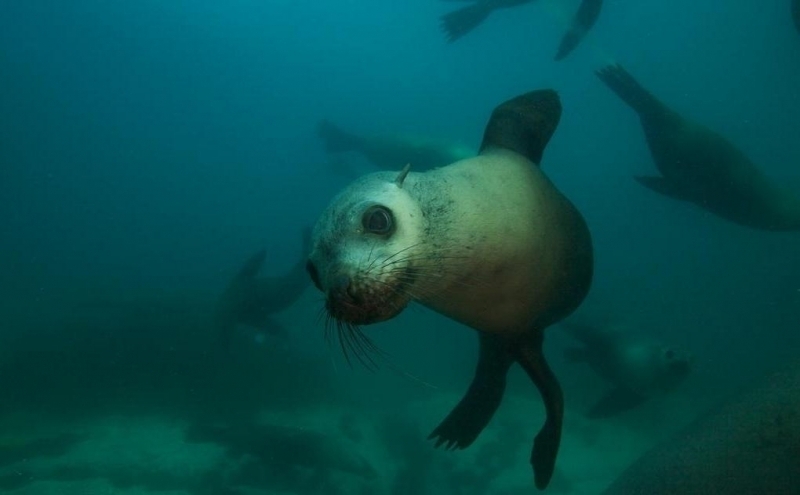 Antarctic Fur Seals feed primarily on krill, fish and squid. 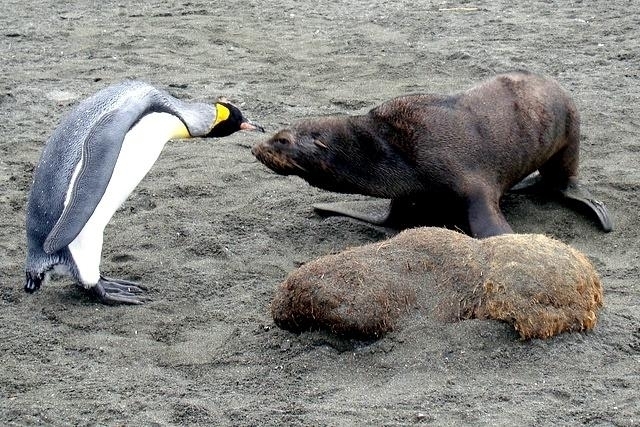 Birds are eaten occasionally outside the breeding season. 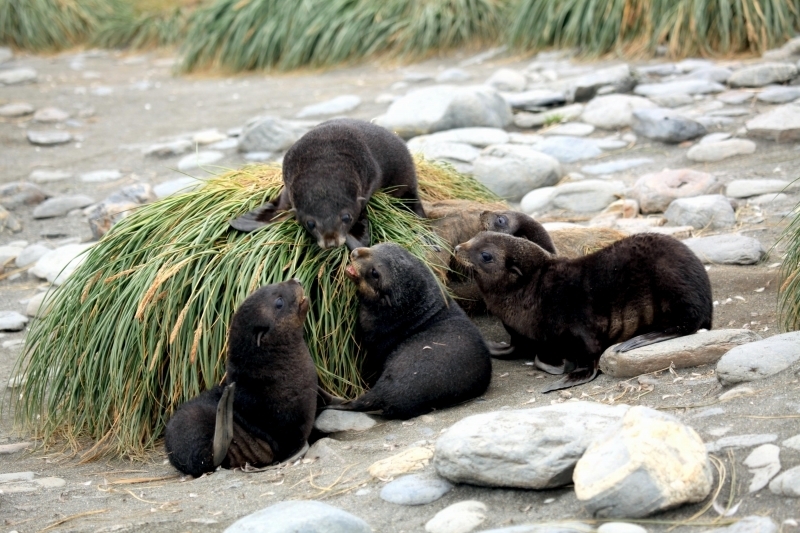 Nursing mothers near South Georgia are dependent on krill during the breeding season, therefore the availability of krill is important to the reproductive success of this animal. 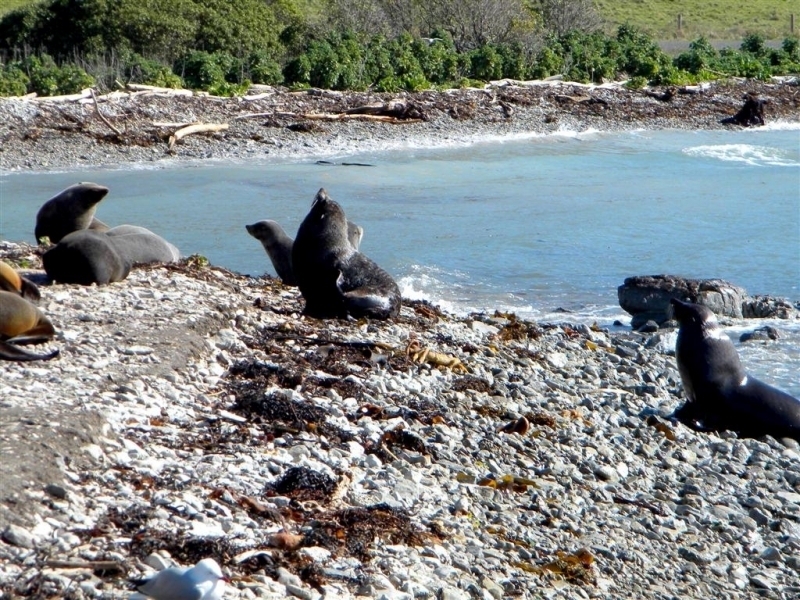 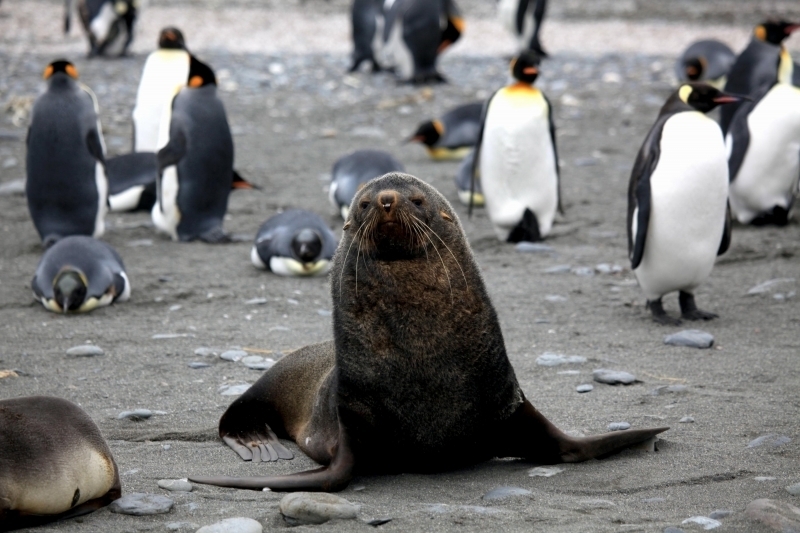 The colonies at Macquarie Island and the Kerguelen Island rely more on a diet of fish & squid. 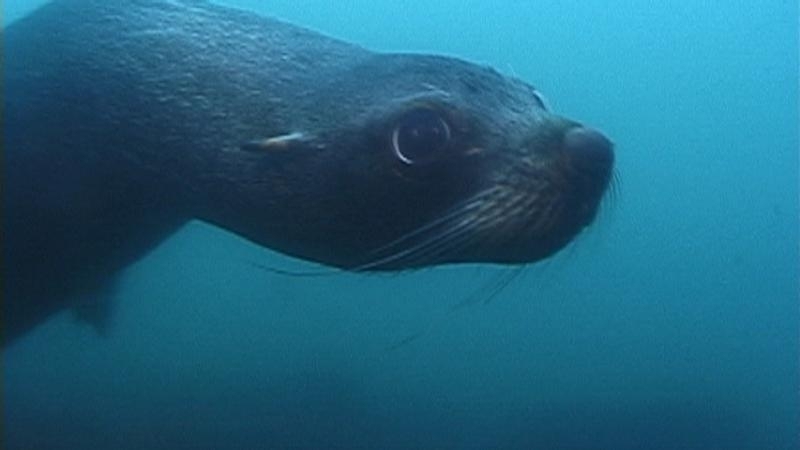 Antarctic Fur Seals dive at night to feed. 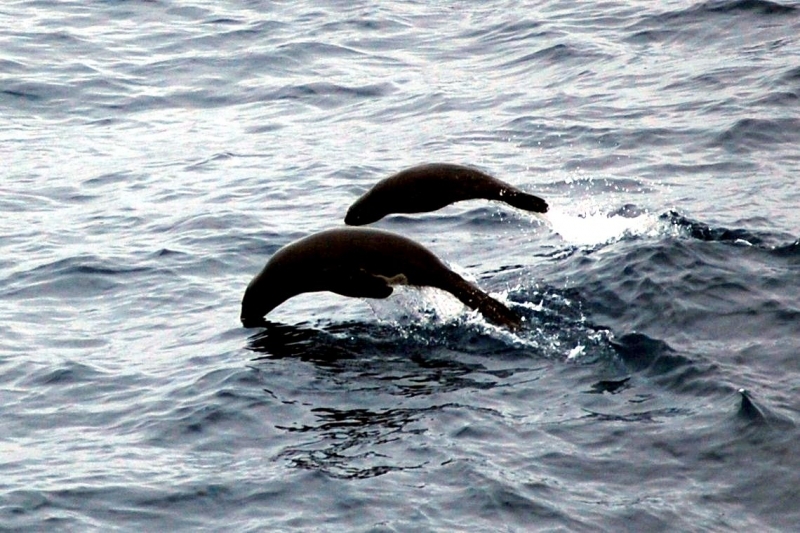 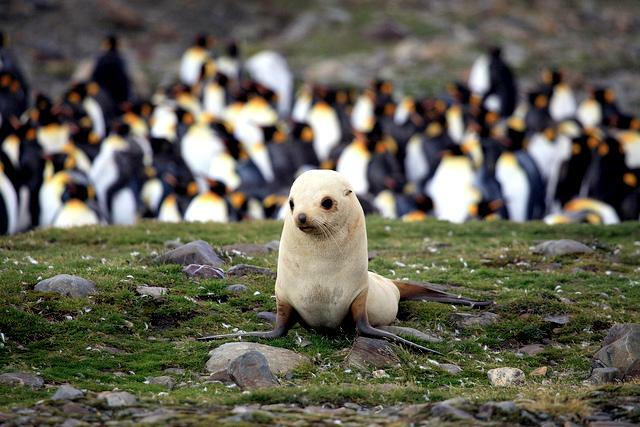 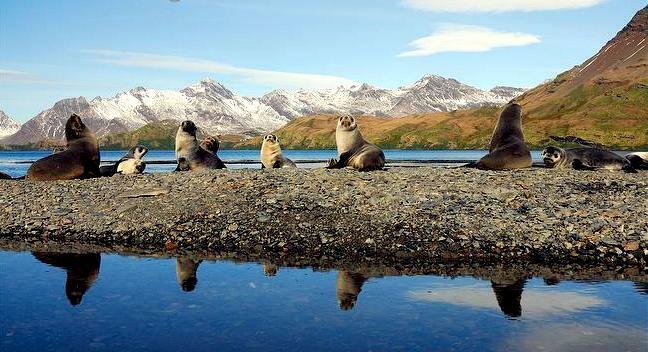 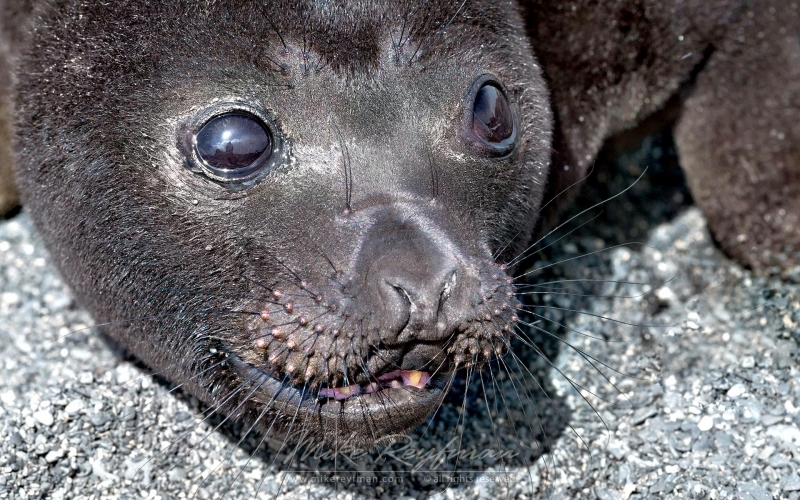 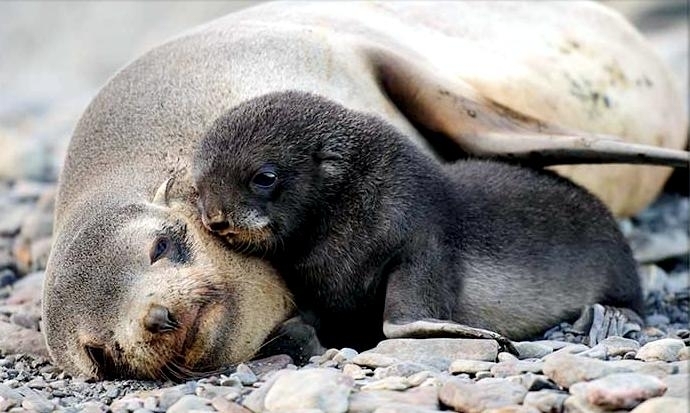 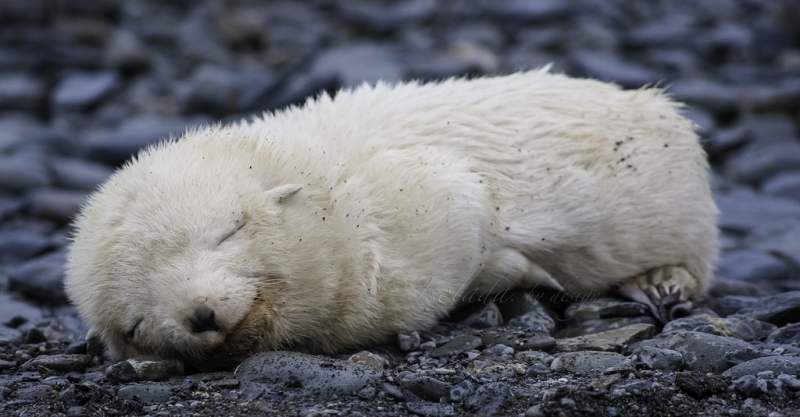 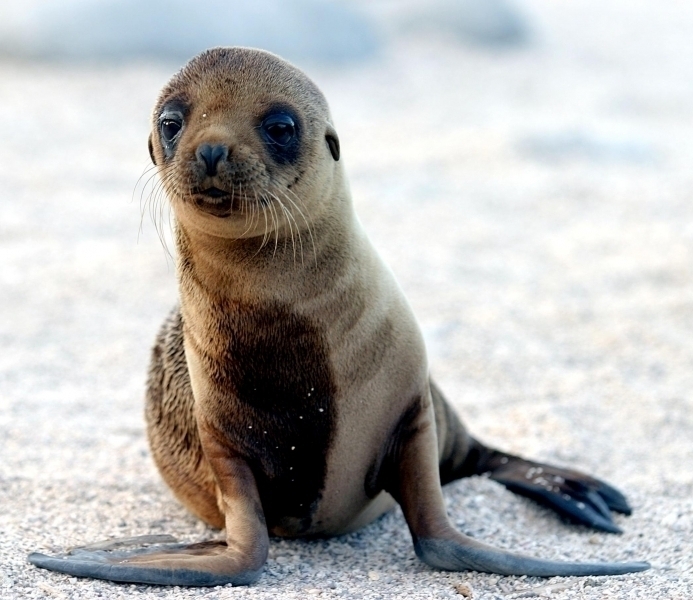 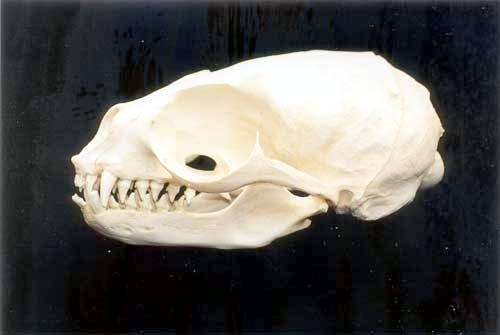 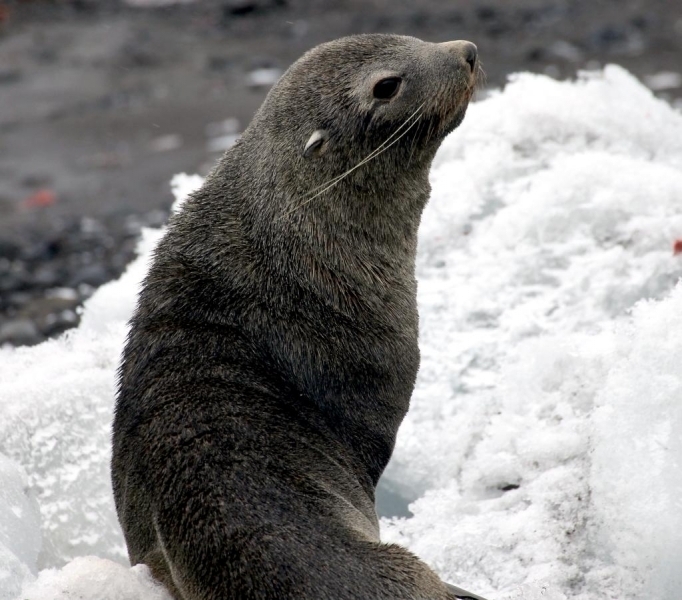 Predators of Antarctic Fur Seals include Killer Whales & Leopard Seals which prey on juveniles and pups. 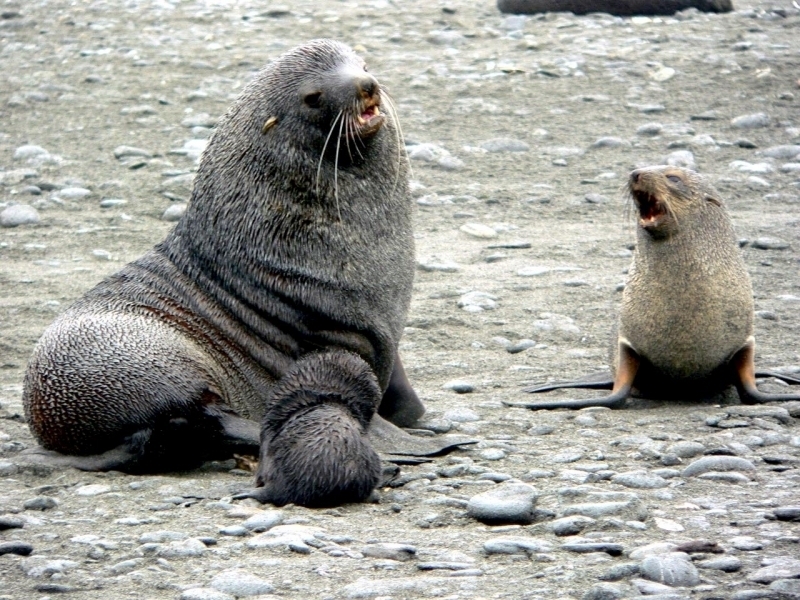 Both sexes of the Antarctic Fur Seal reach sexual maturity at 3-4 years but males do not reach territorial status until about 6-10 years. 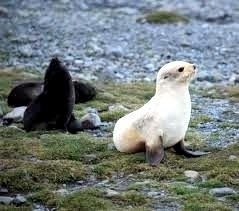 Breeding season is from November to January. 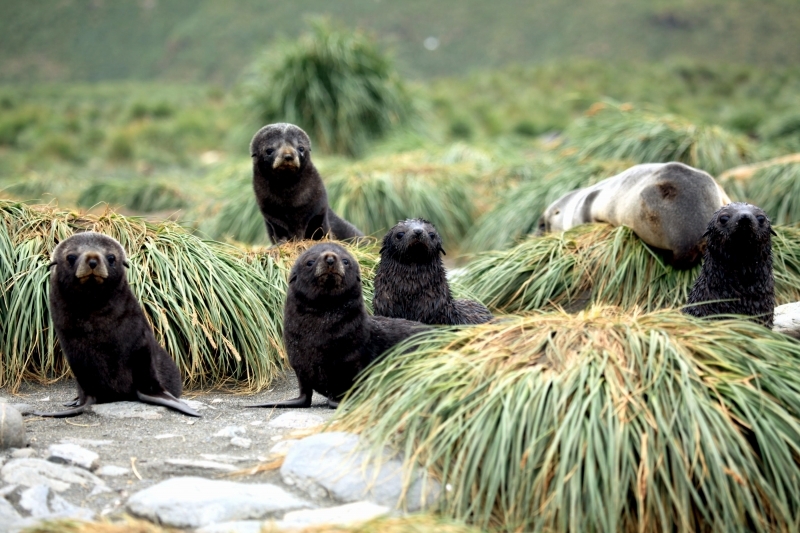 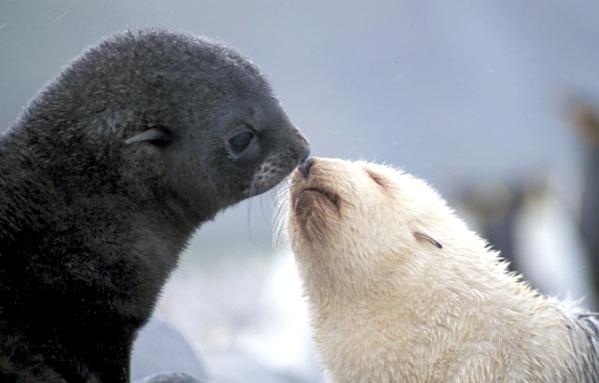 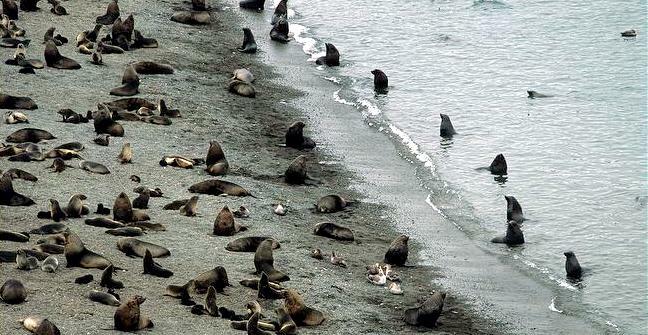 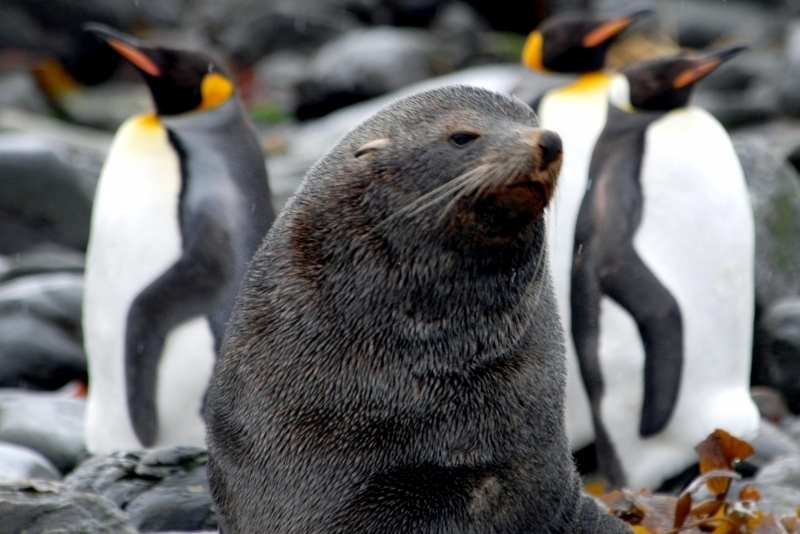 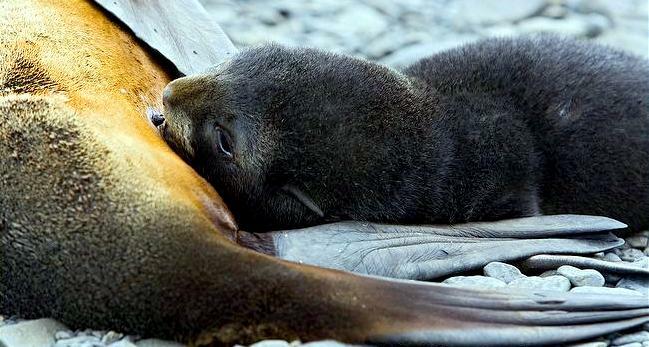 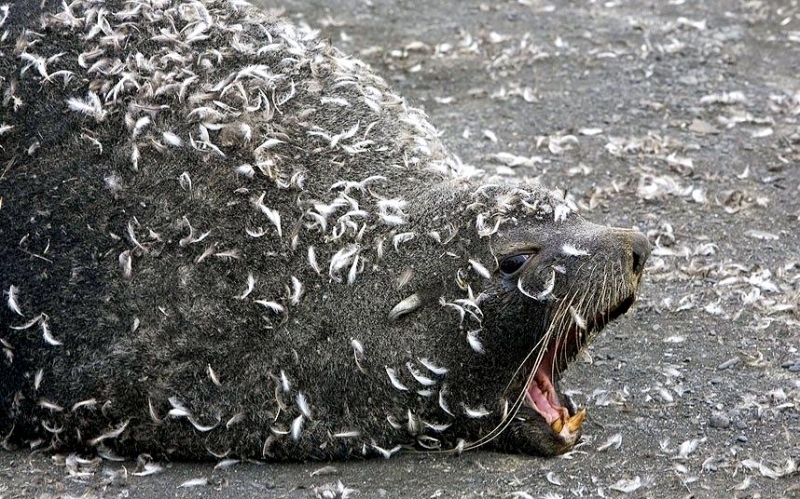 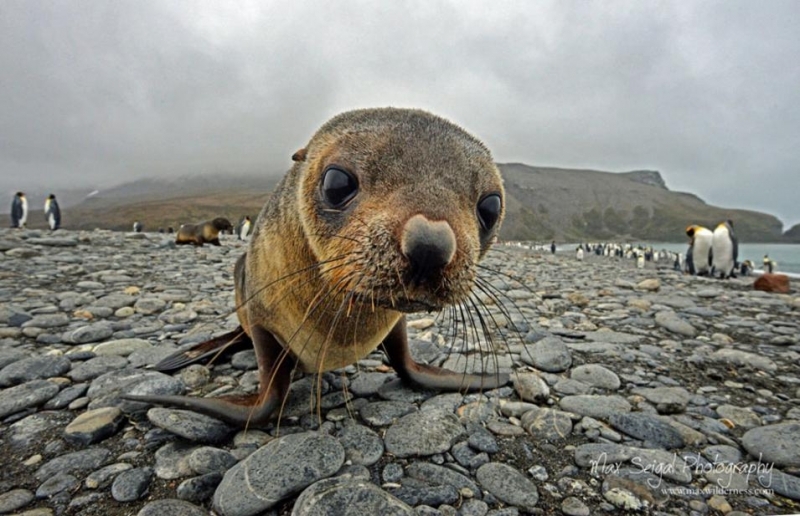 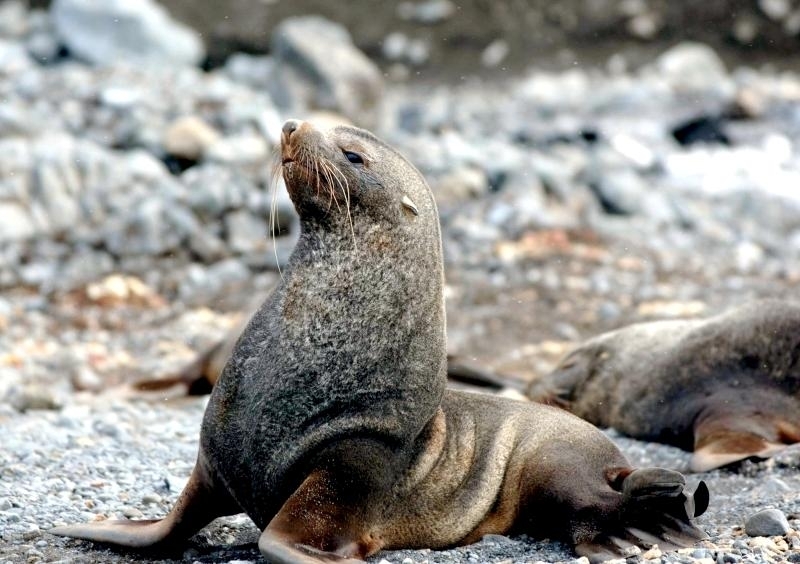 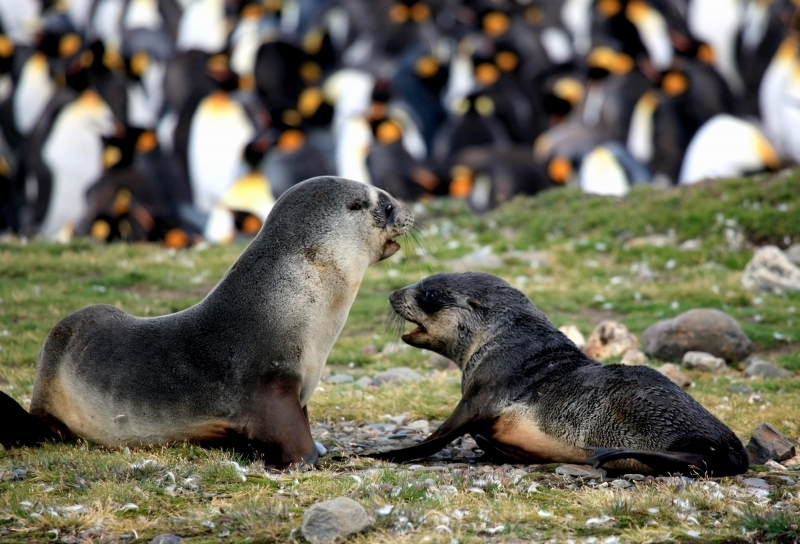 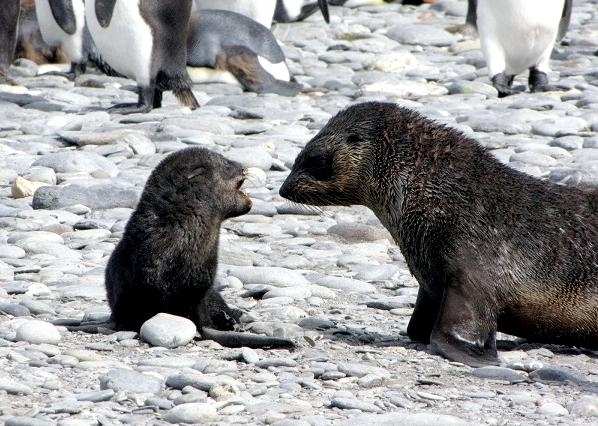 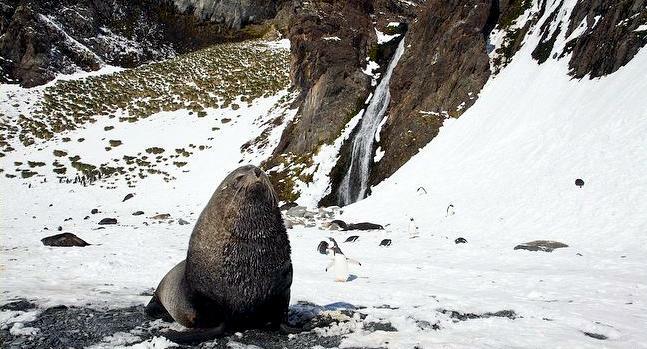 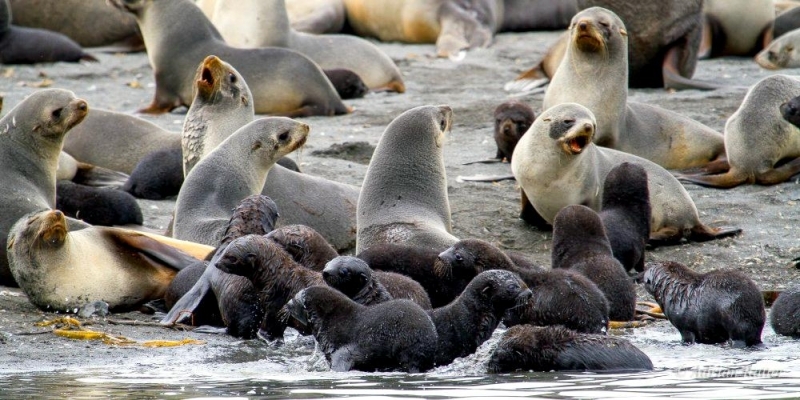 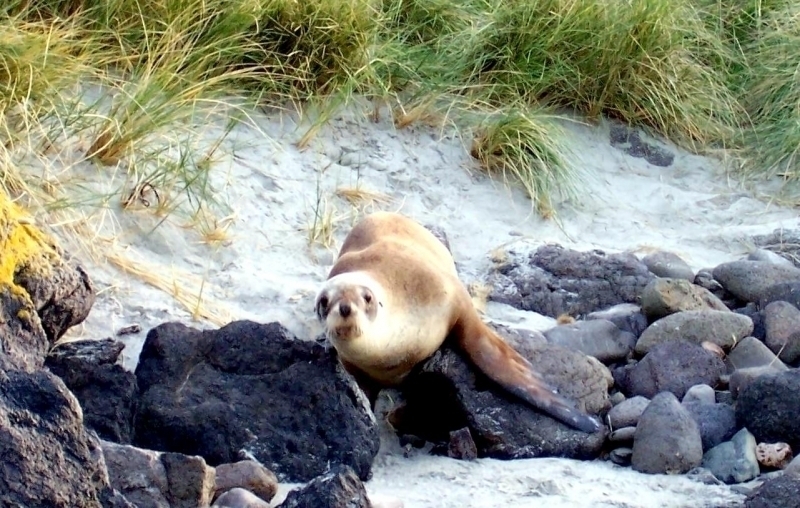 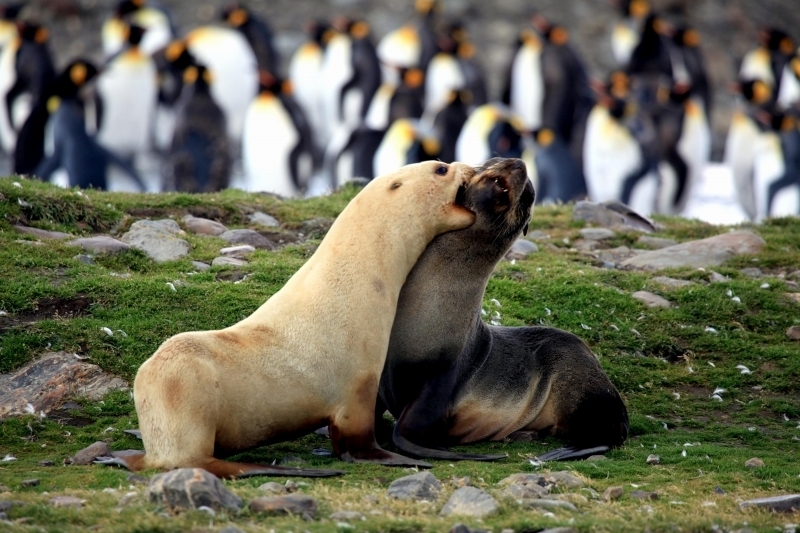 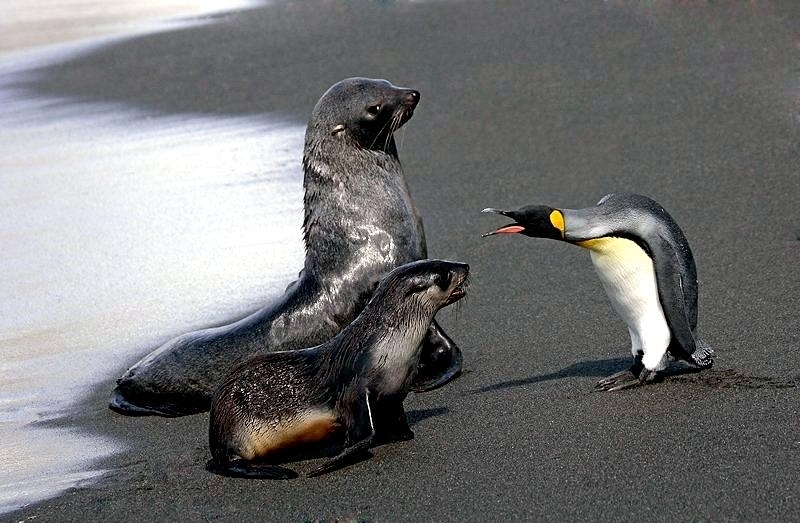 The male Antarctic Fur Seals arrive early to compete for breeding territory and females by fighting with other males. 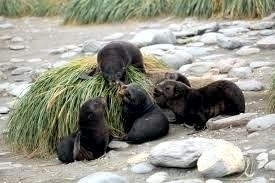 Each male dominated breeding territory includes about 10 females. 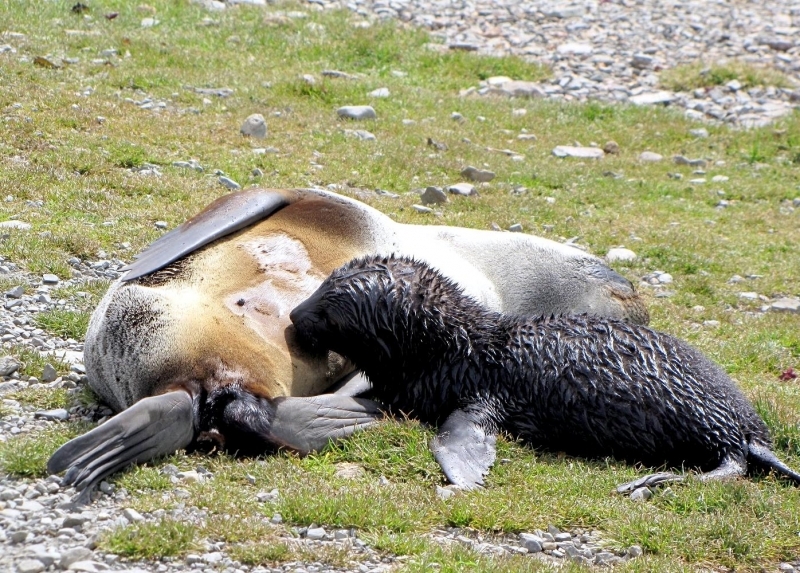 Females give birth about 2 days after arriving, then mate 6-8 days later. 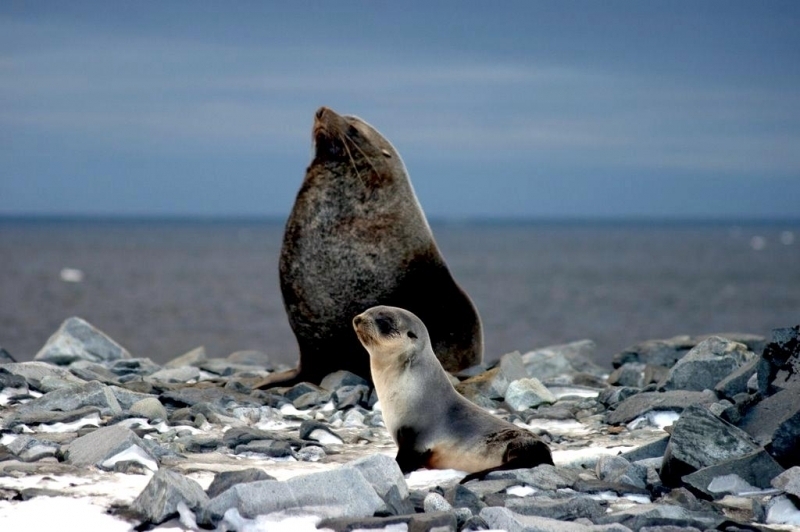 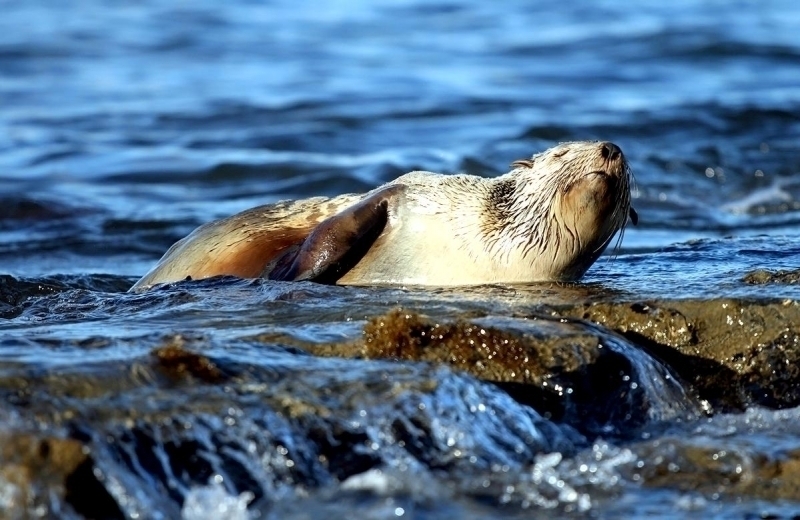 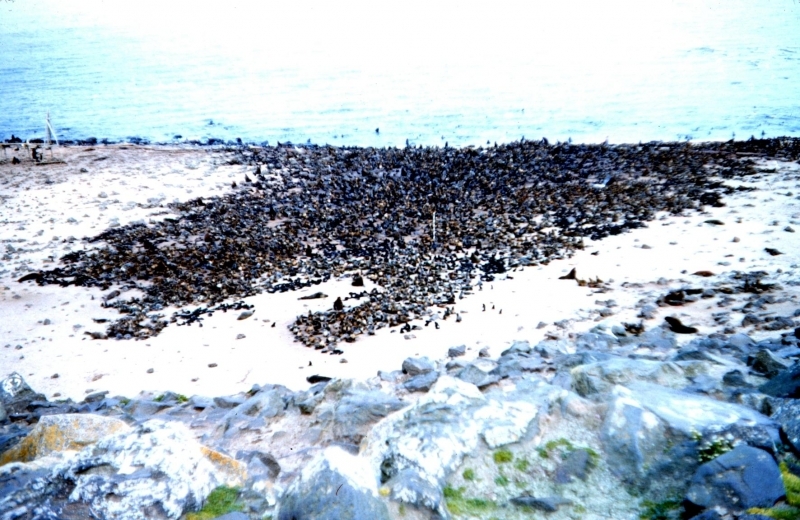 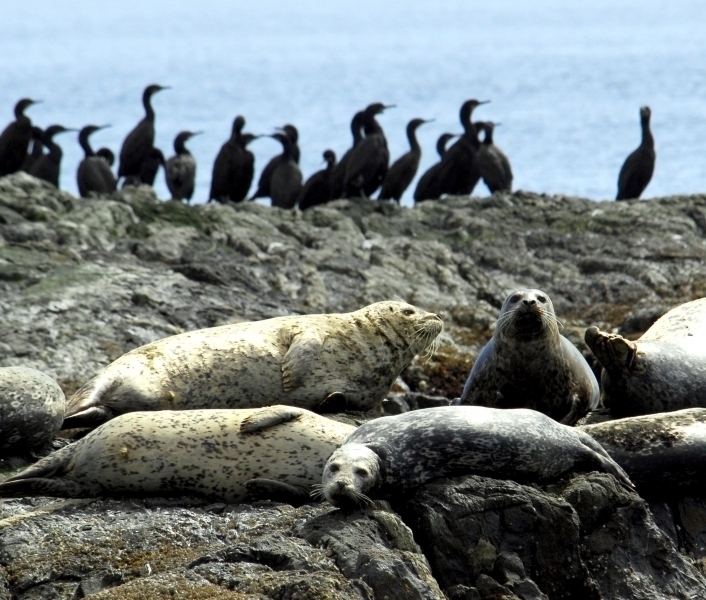 They then leave to feed at sea for 3-5 days at a maximum range of 150-240 kilometers from the breeding territory. 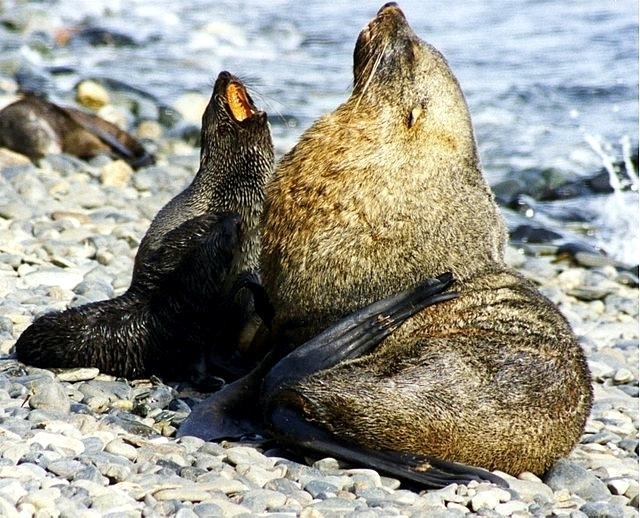 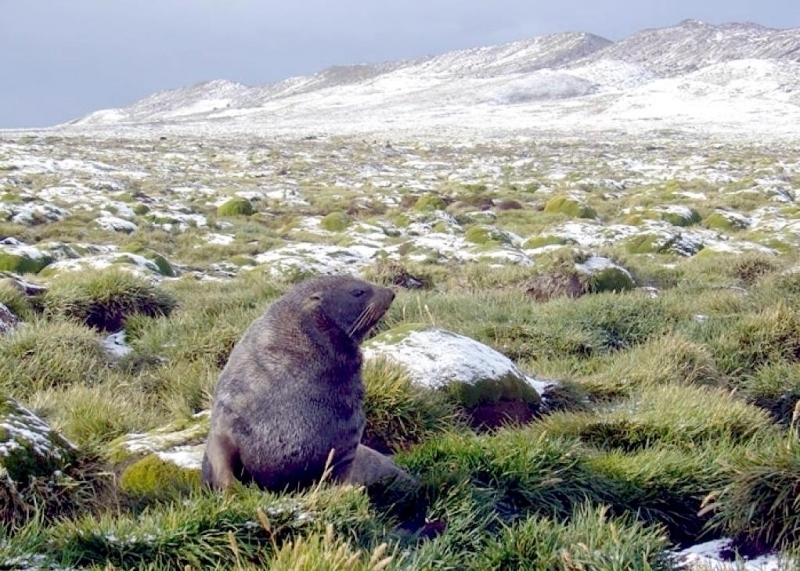 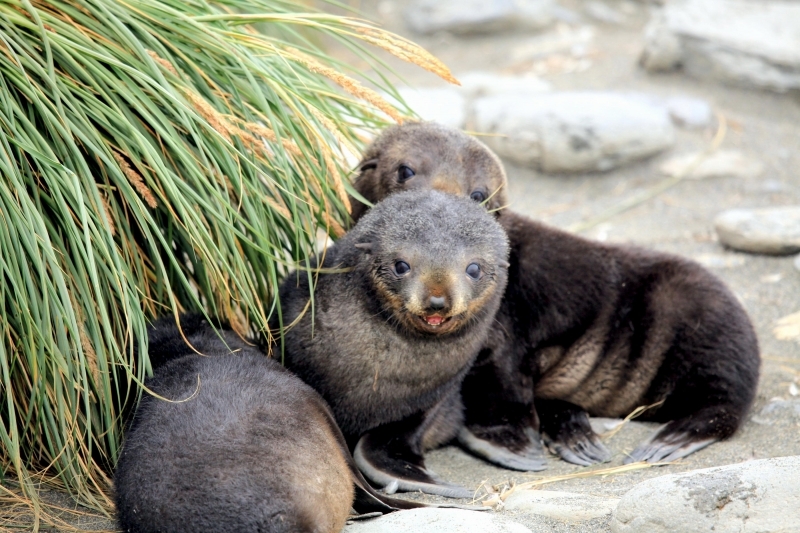 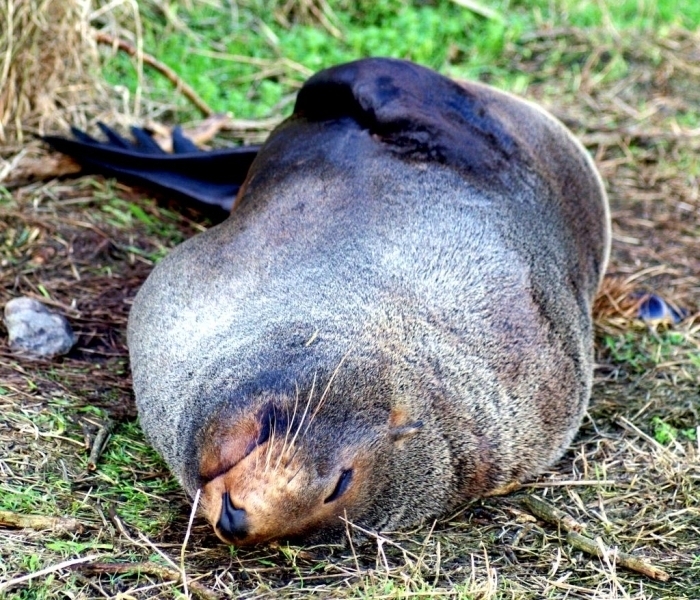 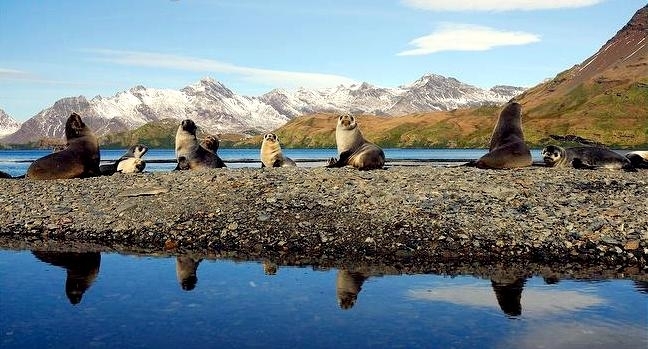 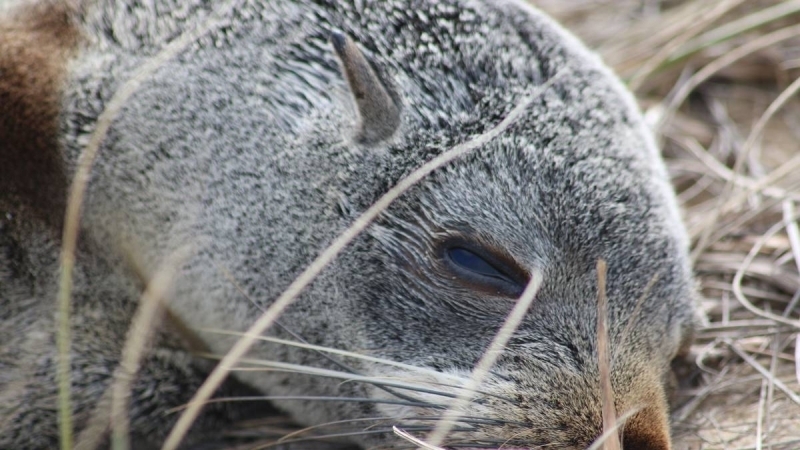 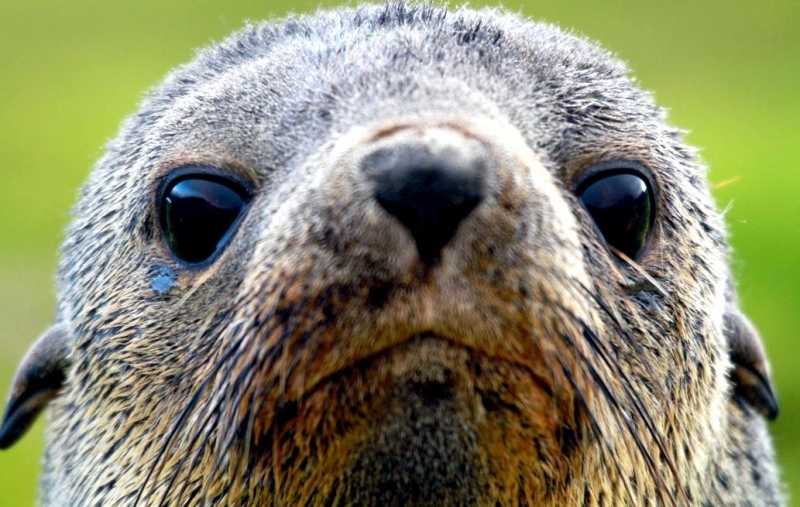 Antarctic Fur Seals return to nurse for 1-2 days then begin the feeding cycle again which lasts up to 4 months, a shorter cycle than other fur seal species. 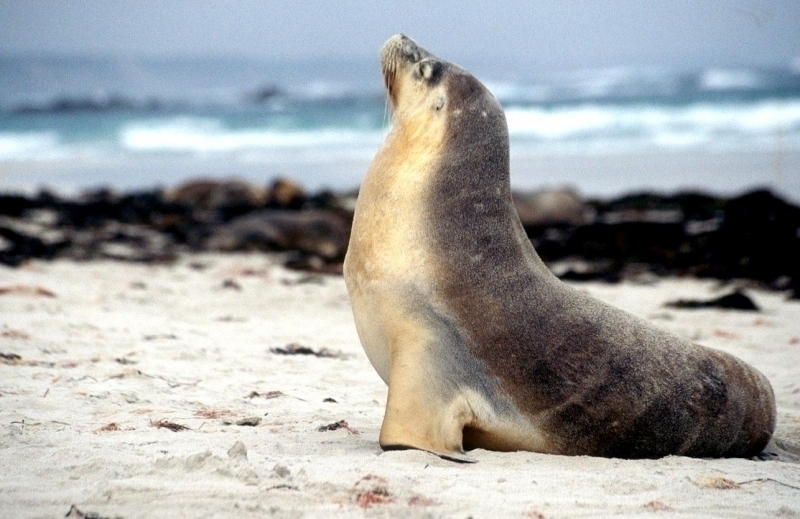 Males do not feed during breeding season and lose about 1.5 each day for the 30 days that they are on land. 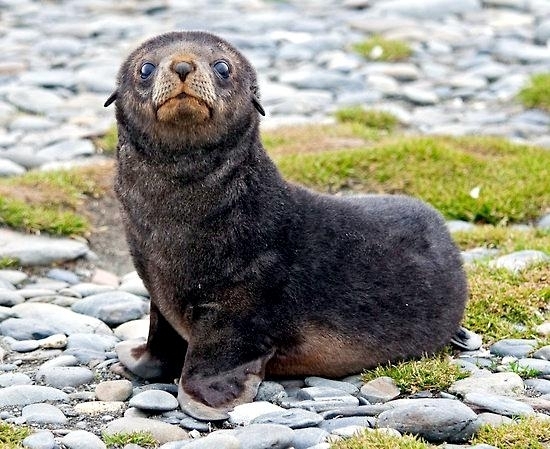 Pups are born with a black fur coat, which molts 2-3 months later revealing a silver-gray coat that eventually takes on a more brown color that turns darker by adulthood. 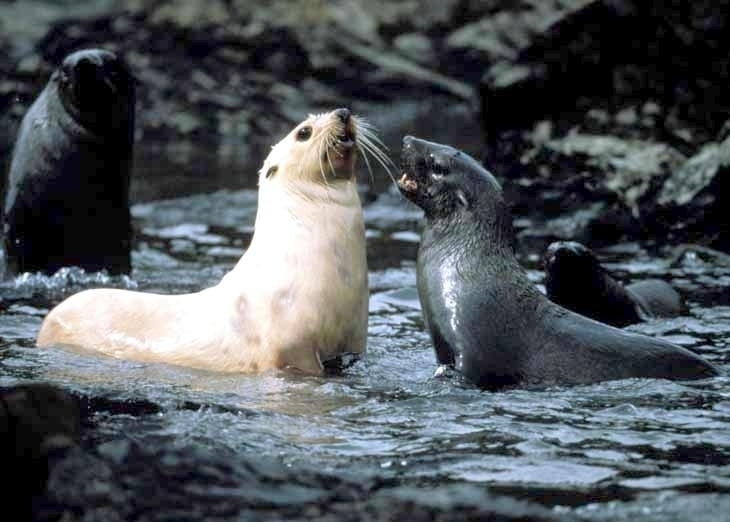 Adult females and juveniles often have a cream-colored chest and occasionally, individuals are creamy white all over. 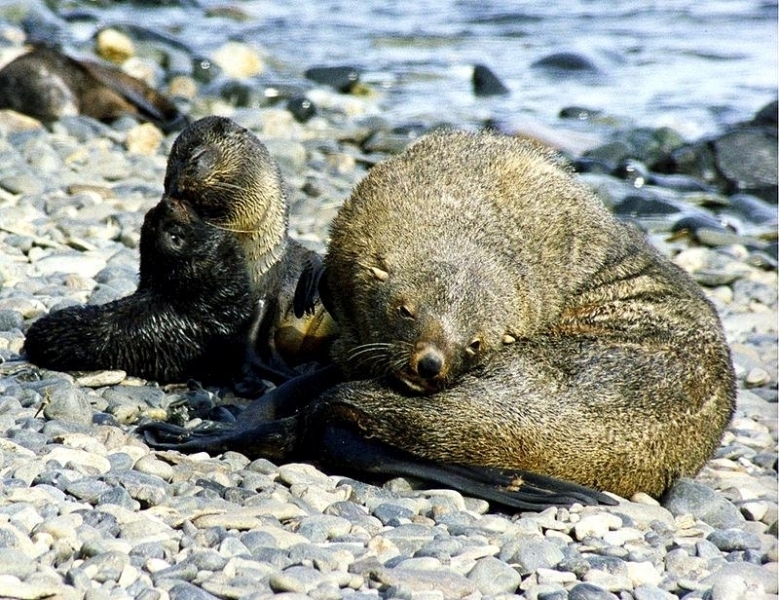 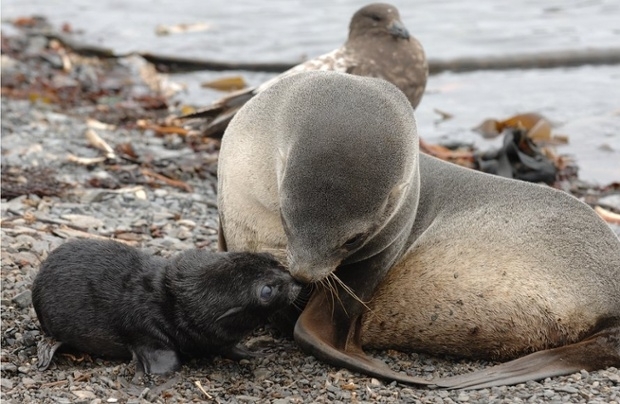 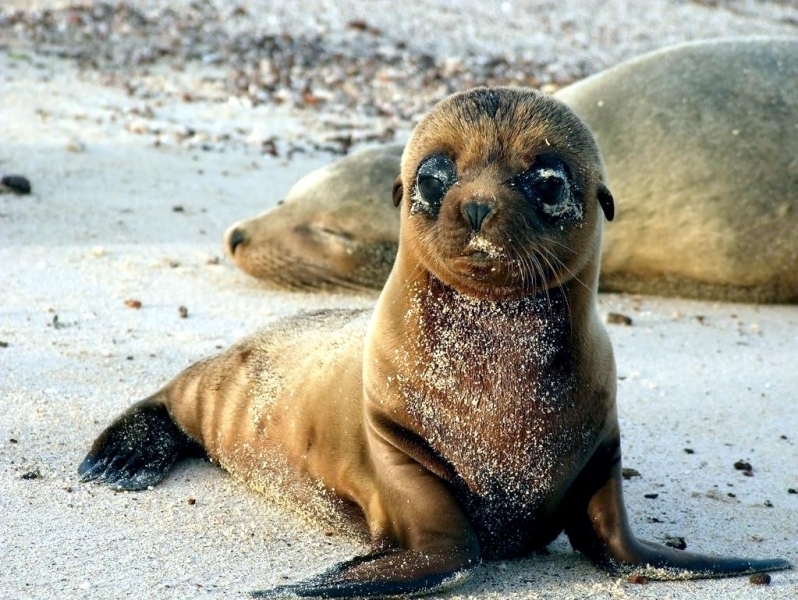 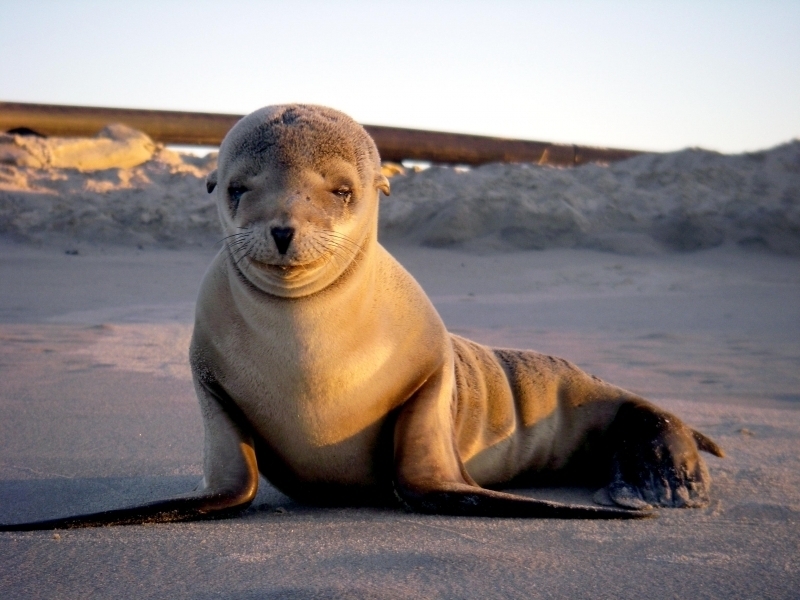 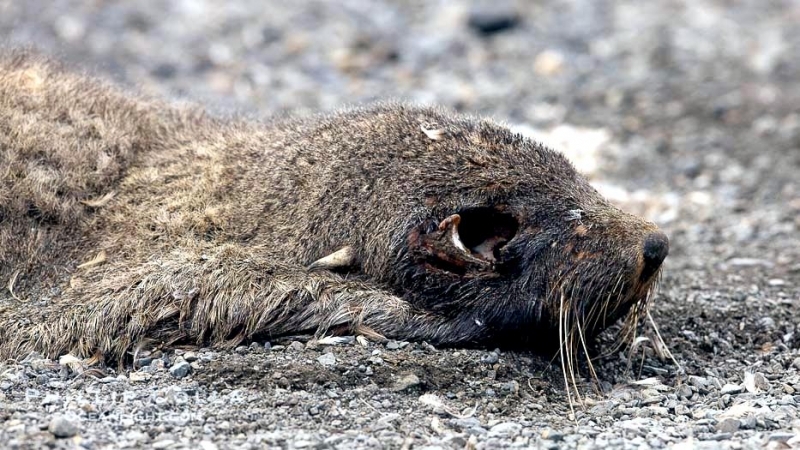 Antarctic Fur Seal Pup mortality over the first year of life has been calculated at 24% and is greater on the denser breeding beaches.